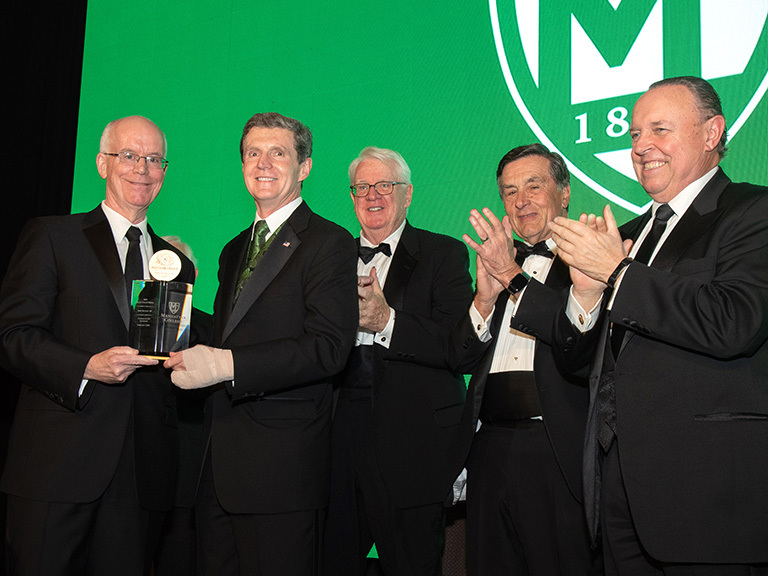 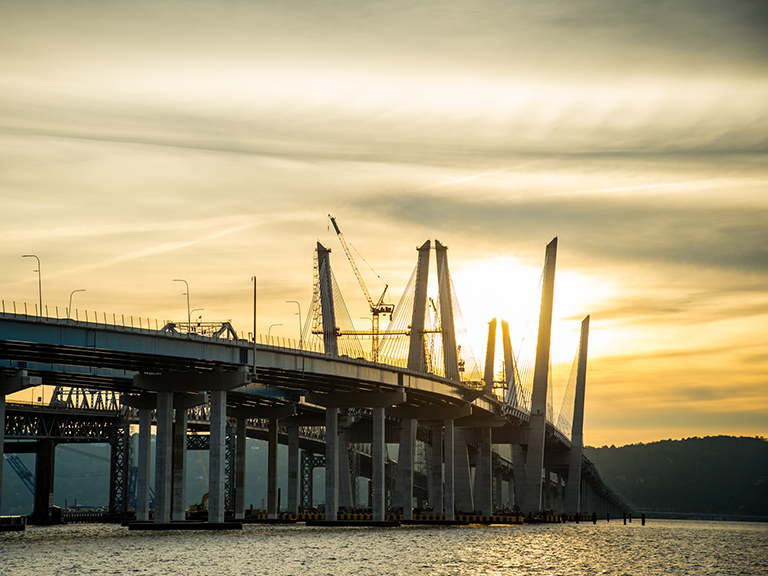 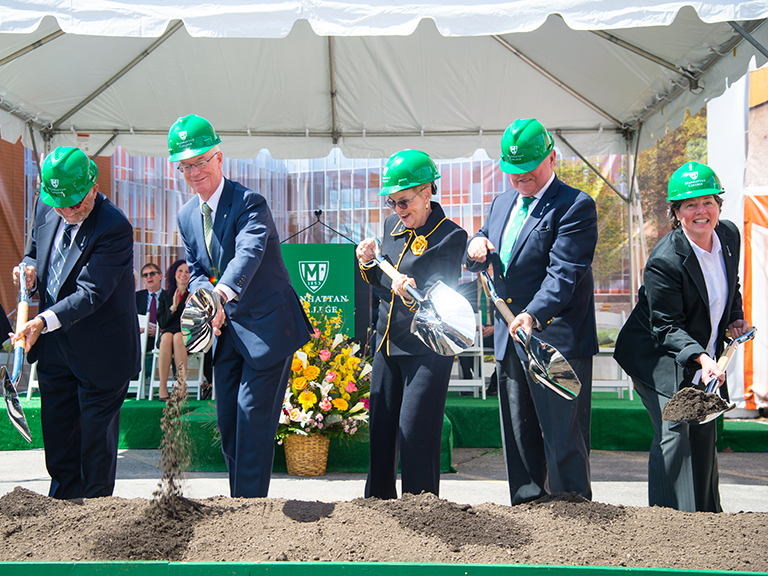 Manhattan College alumni contribute to the new Governor Mario M. Cuomo Bridge, the largest bridge in New York State history. 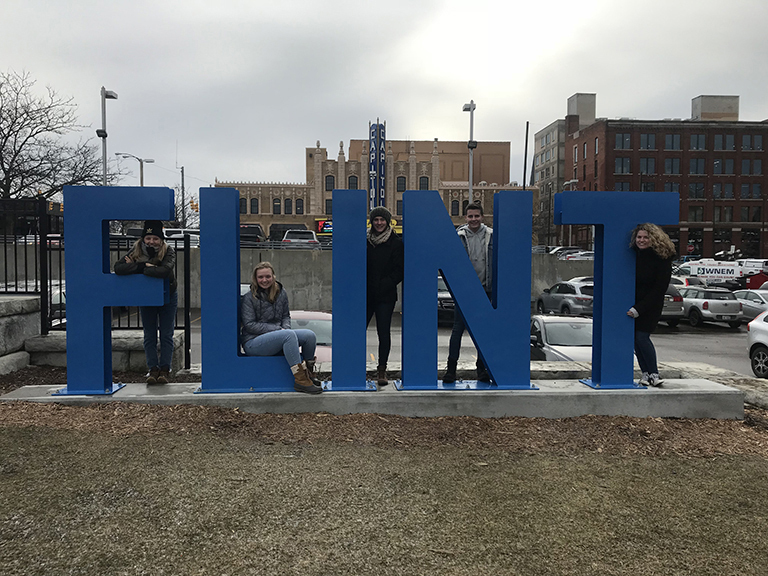 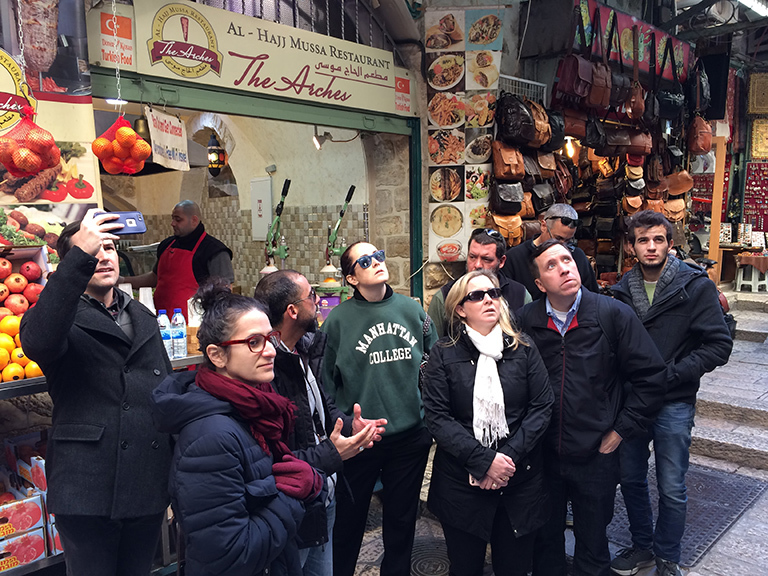 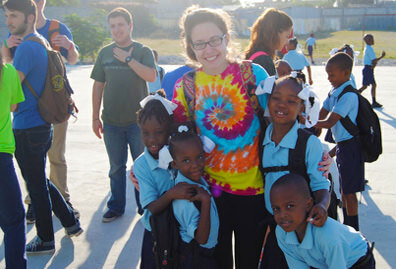 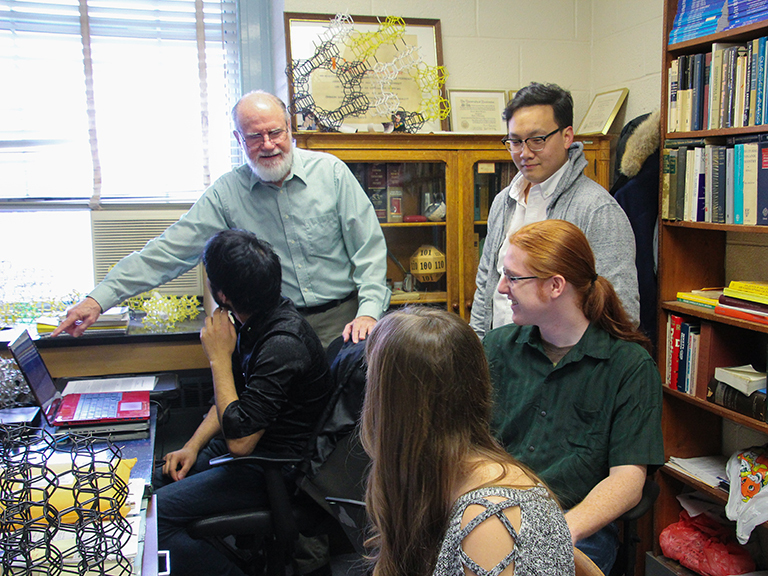 While some students hit the beaches for a week in March, others travel to offbeat locations. 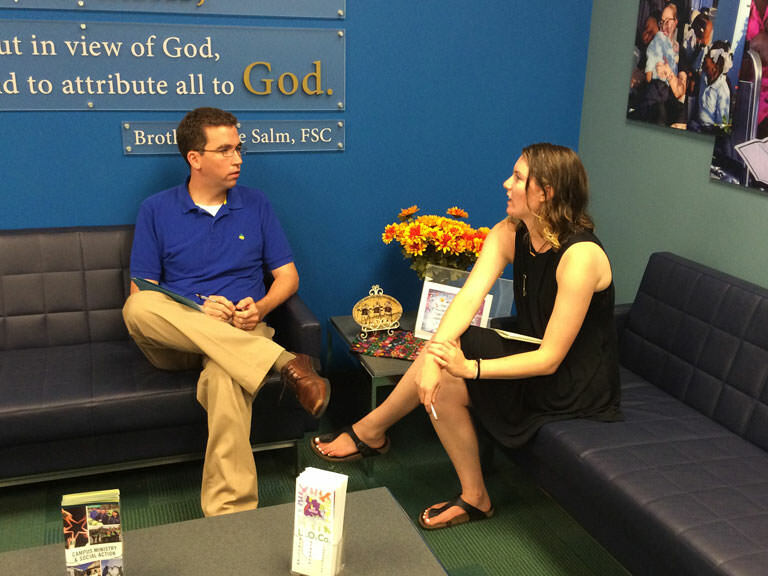 Two recent grads prepare for the Catholic priesthood, as one becomes a Brother. 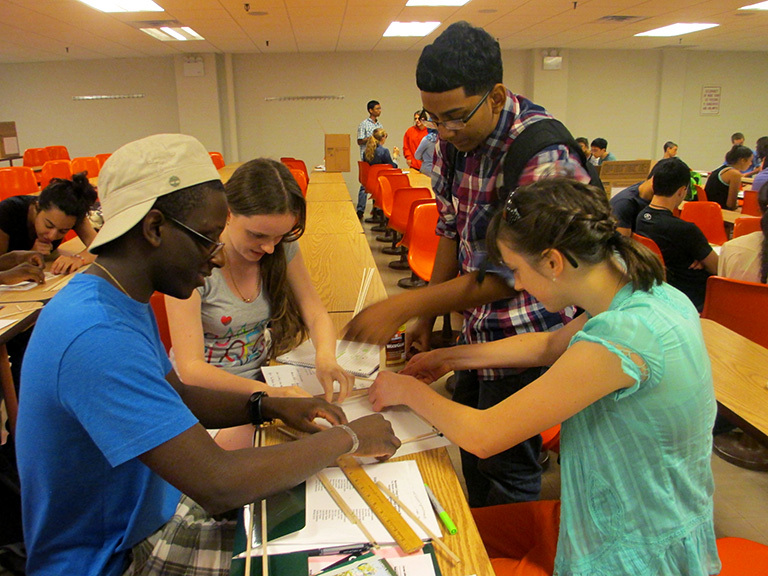 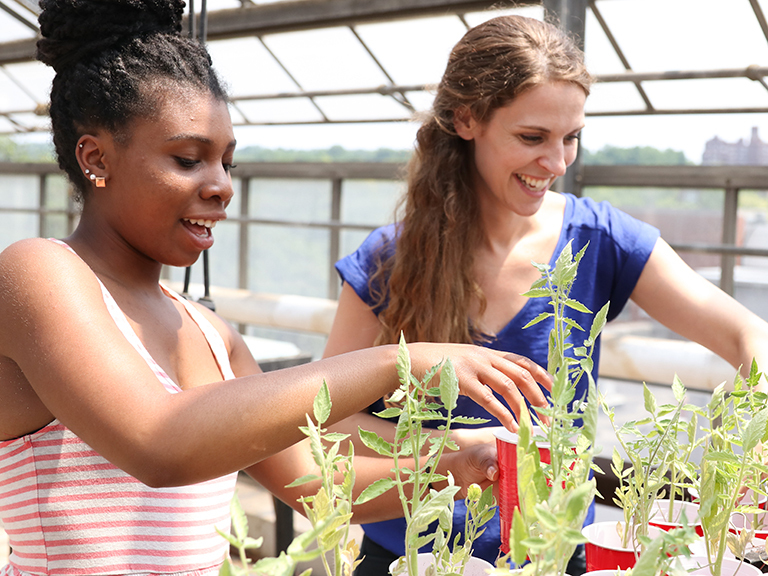 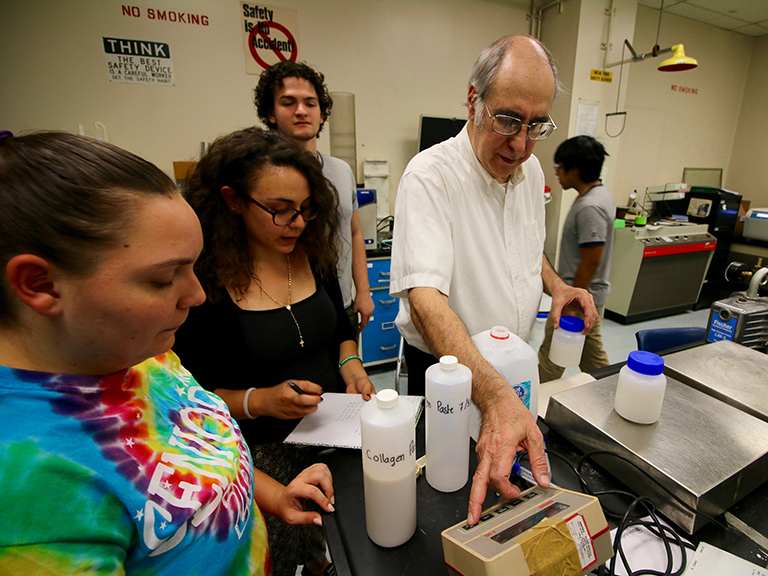 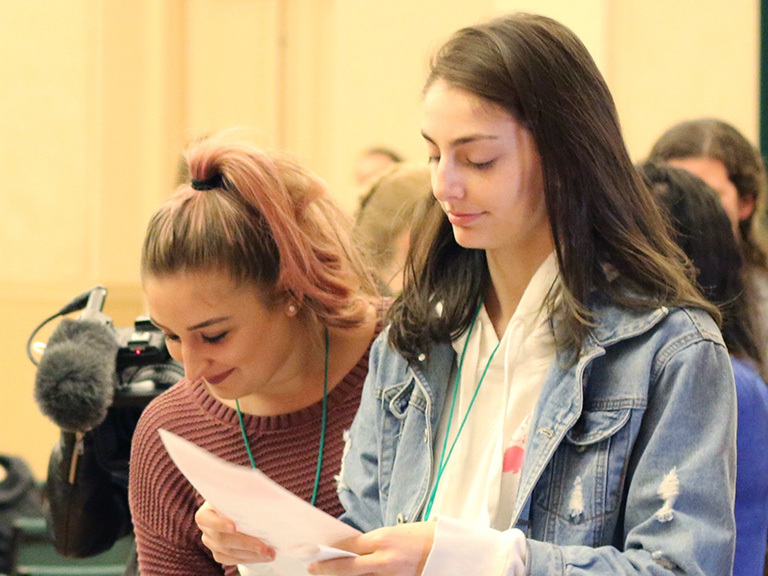 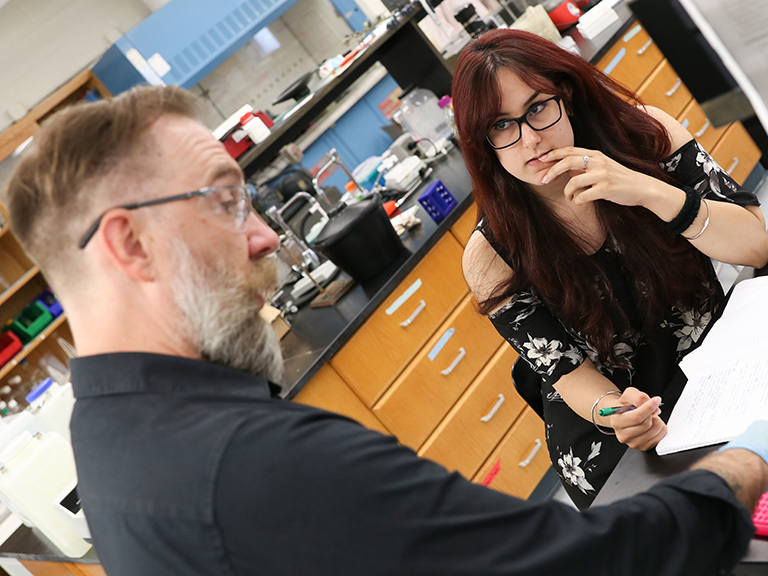 An interdisciplinary program has given neighboring high school students a taste of potential STEM careers and an early look at higher education. 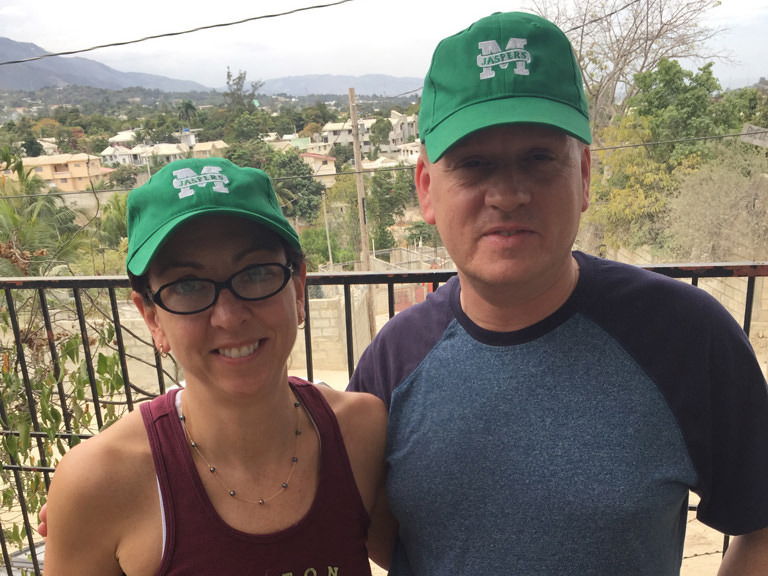 Jasper alumni Steve Smith ’89 and Stephanie (George) Minister ’91 serve on the Board of Directors of the United States Foundation for the Children of Haiti. 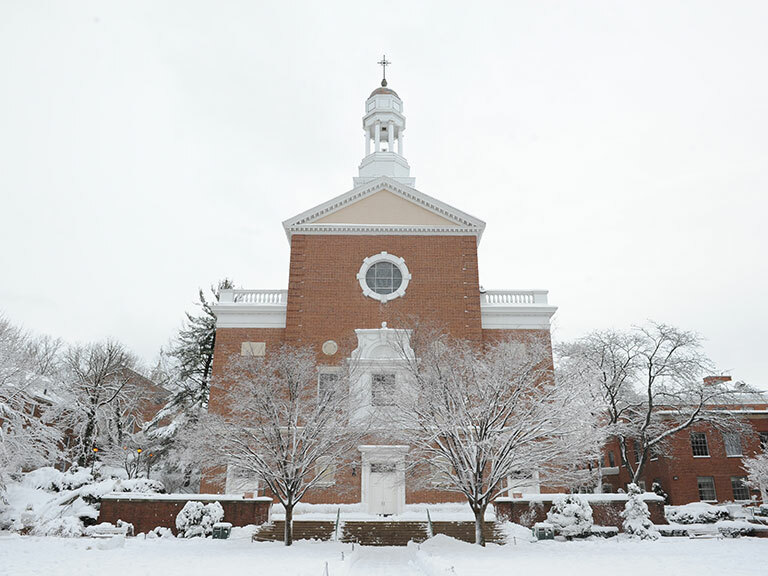 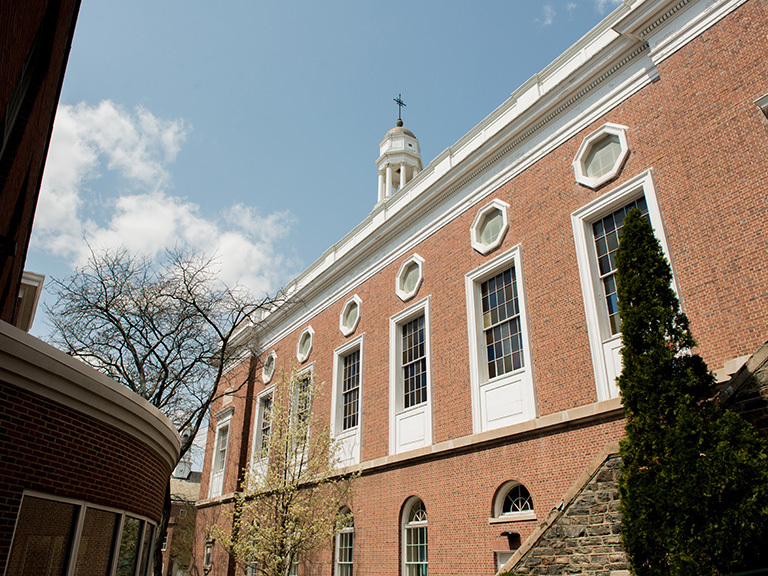 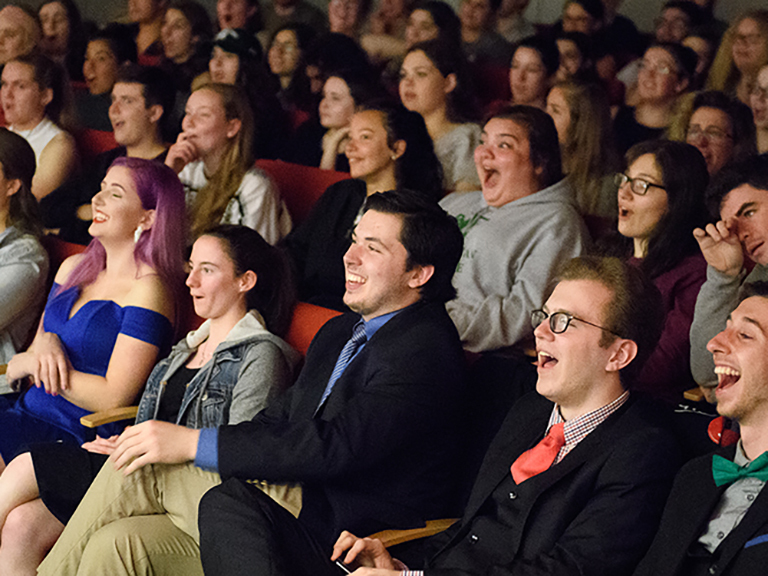 Chris Hoey ’17 shares his personal thoughts on the Lenten season, the seventh in a series of reflections from Manhattan College faculty, students and staff on their journey toward Easter. 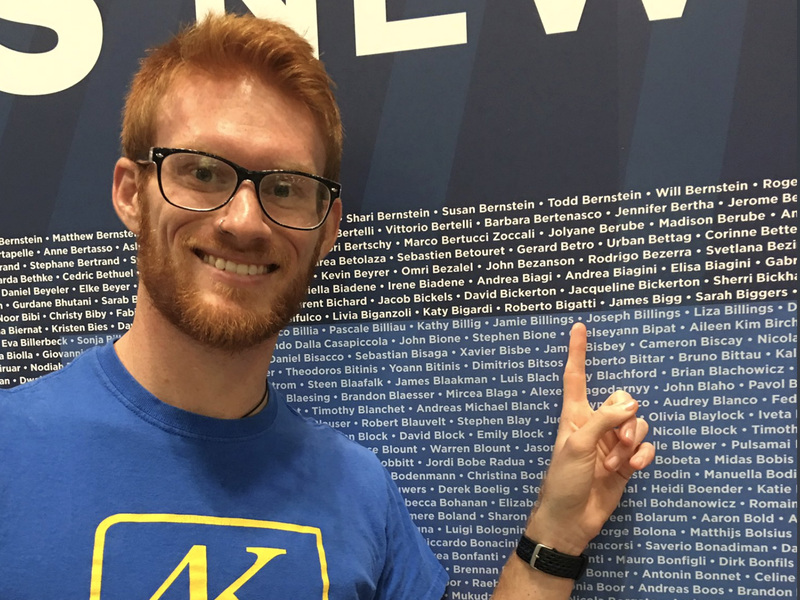 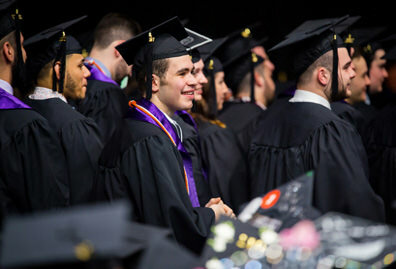 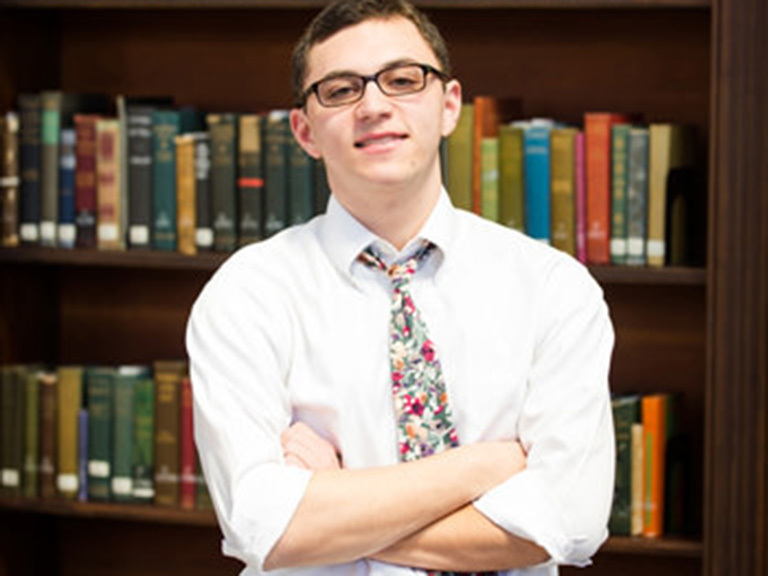 Nelson da Luz ’15, ’16 (M.S.) 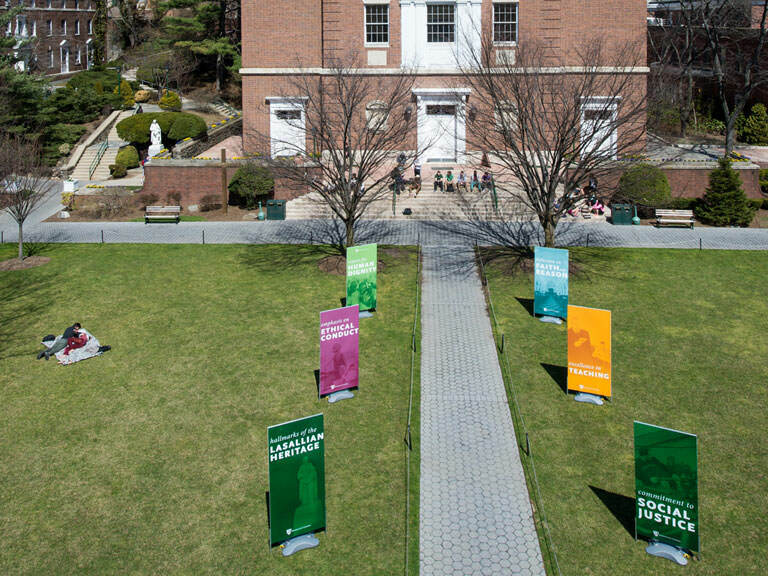 shares his personal thoughts on the Lenten season, the sixth in a series of reflections from Manhattan College faculty, students and staff on their journey toward Easter. 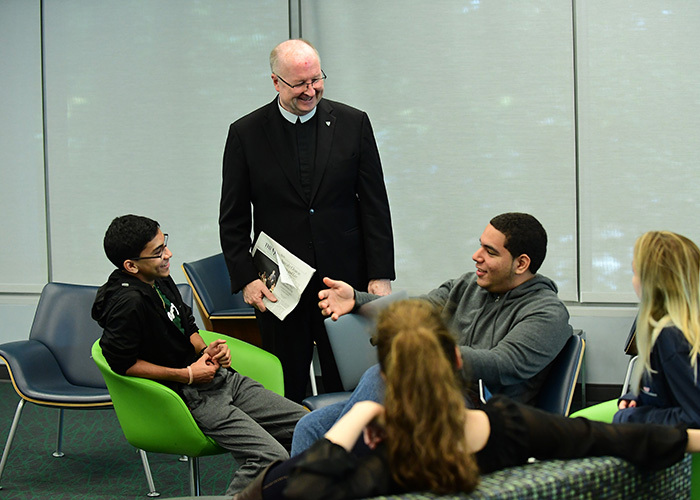 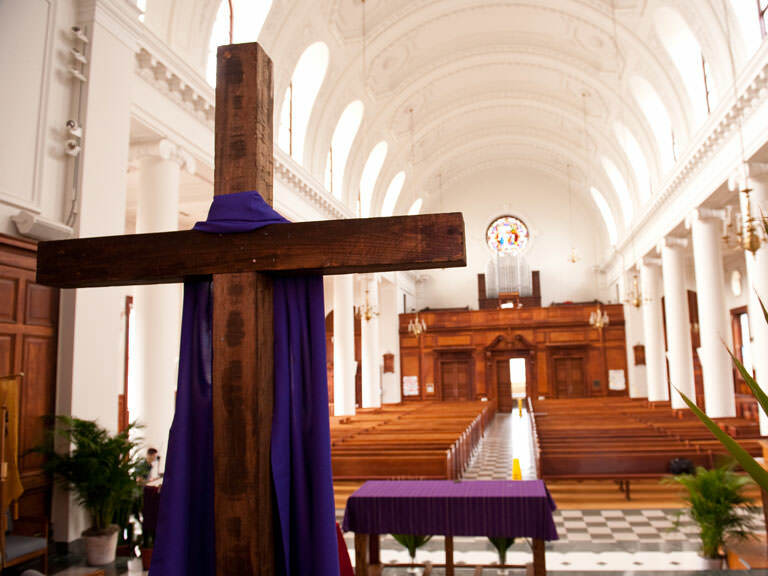 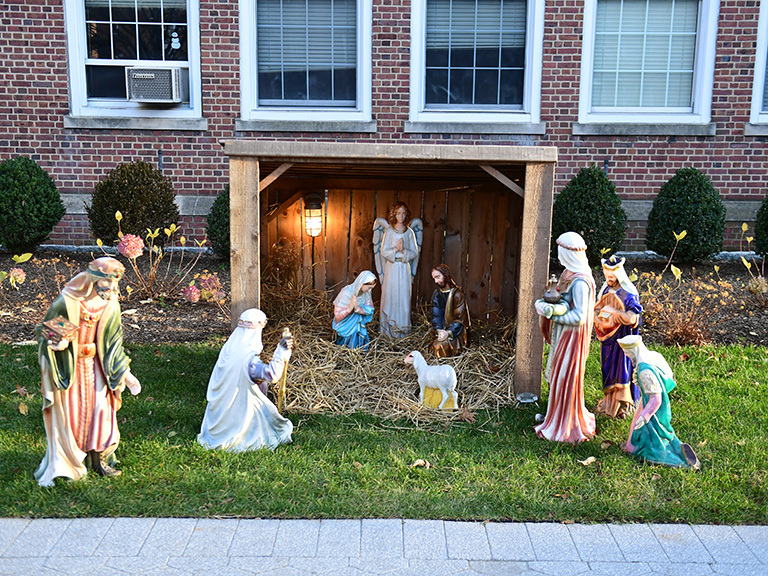 Brother Jack Curran, FSC, vice president for mission, shares his personal thoughts on the Lenten season, the fifth in a series of reflections from Manhattan College faculty, students and staff on their journey toward Easter. 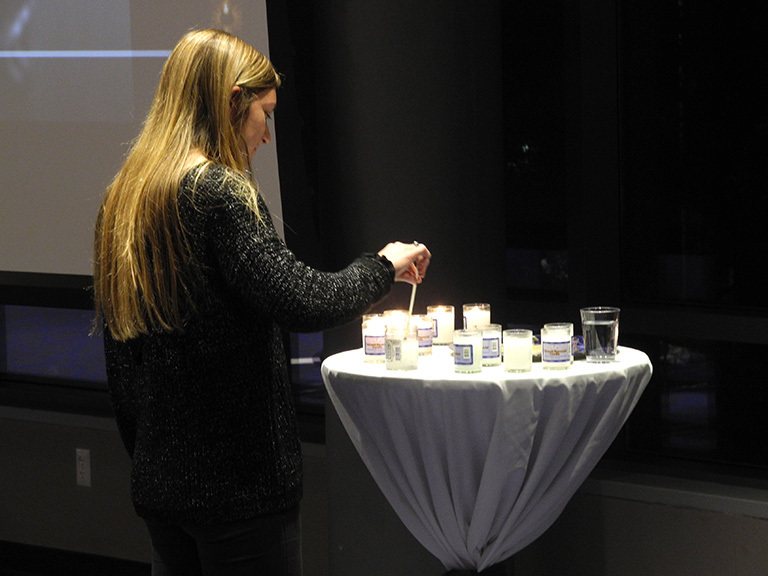 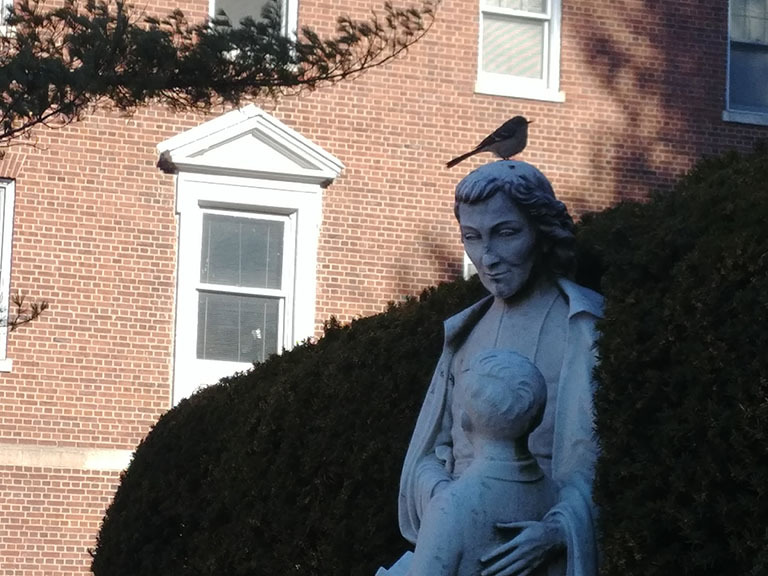 Julia Galdiz ’17 shares her personal thoughts on the Lenten season, the fourth in a series of reflections from Manhattan College faculty, students and staff on their journey toward Easter. 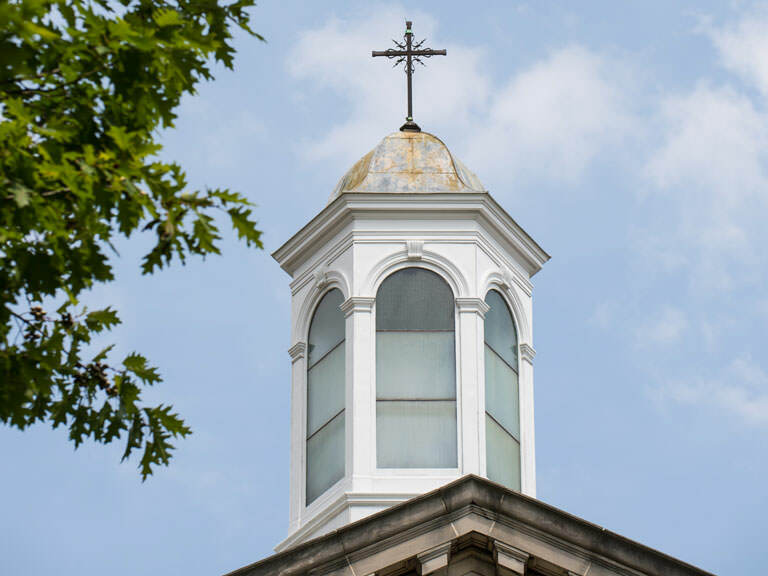 Erica Rebussini ’17 shares her personal thoughts on the Lenten season, the third in a series of reflections from Manhattan College faculty, students and staff on their journey toward Easter. 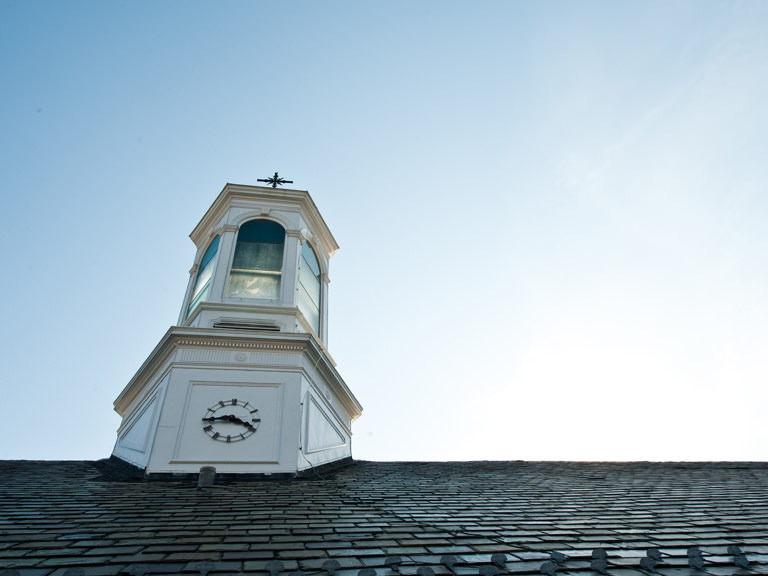 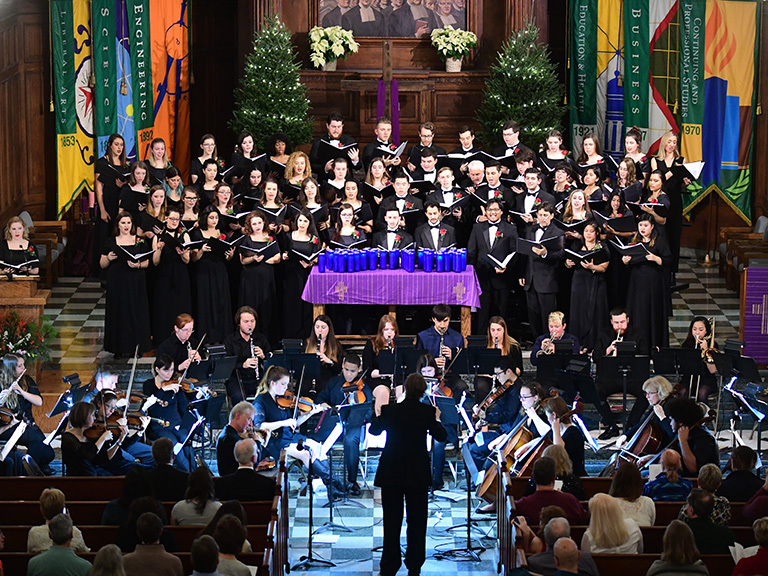 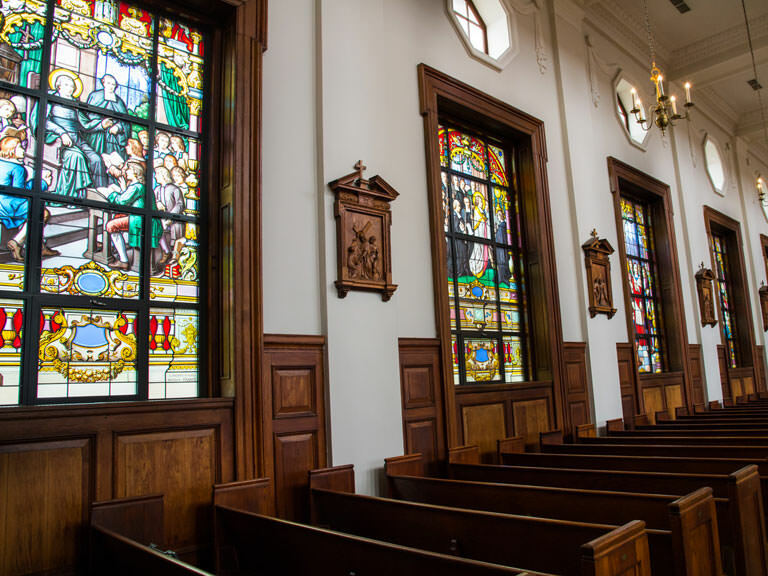 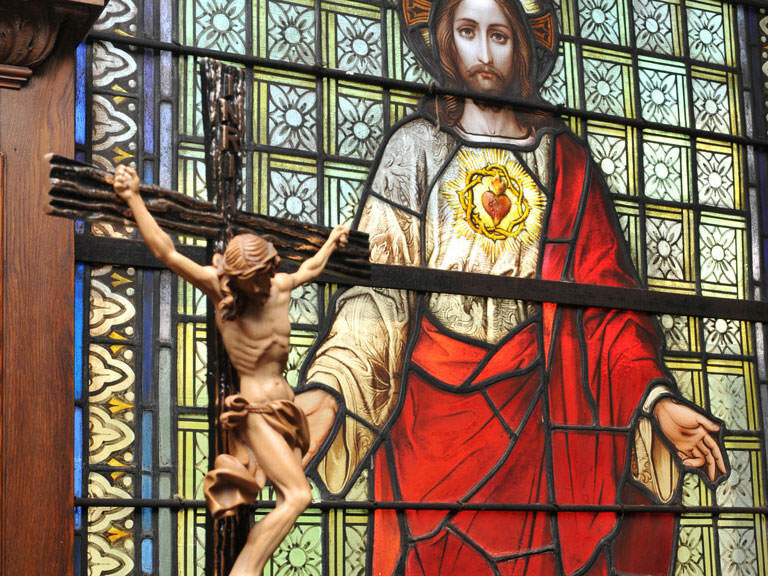 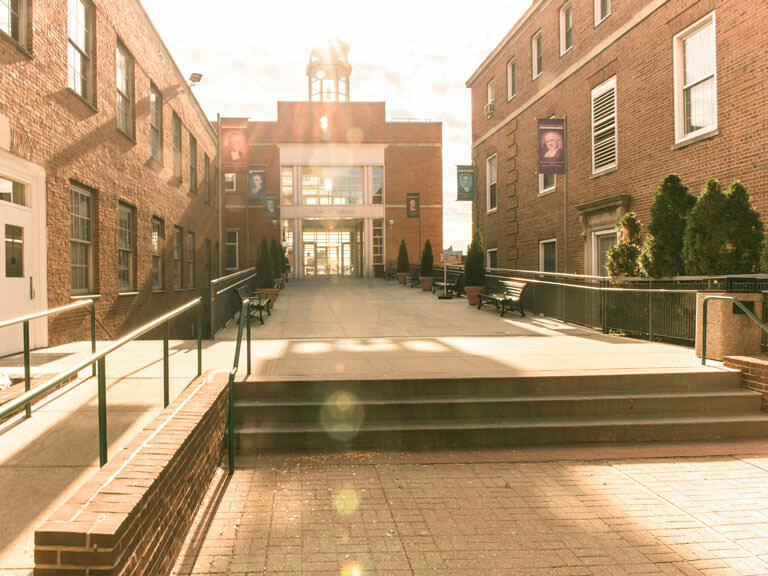 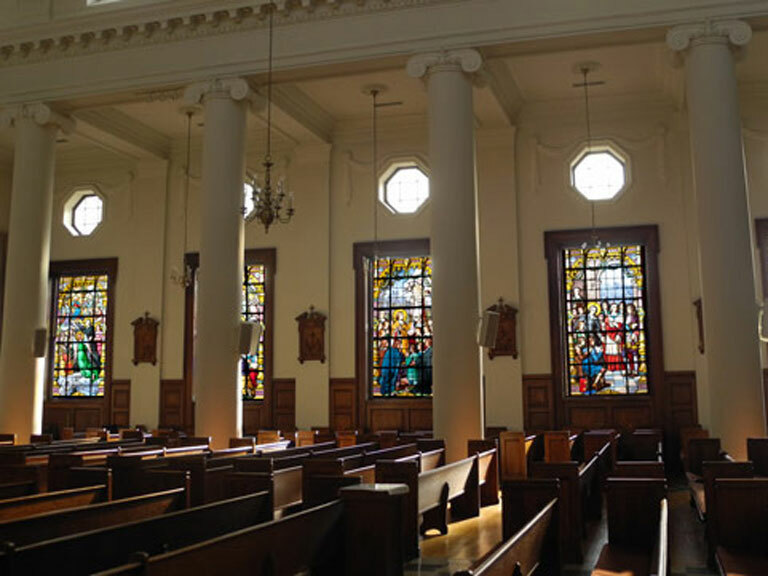 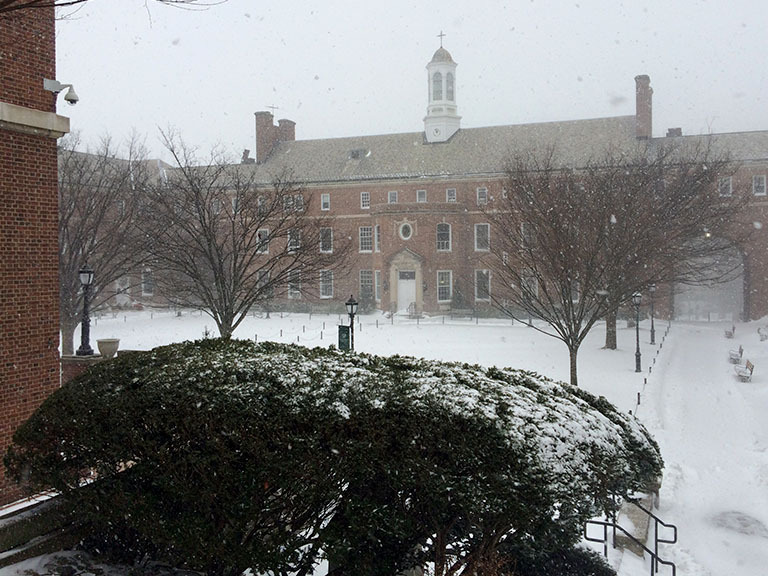 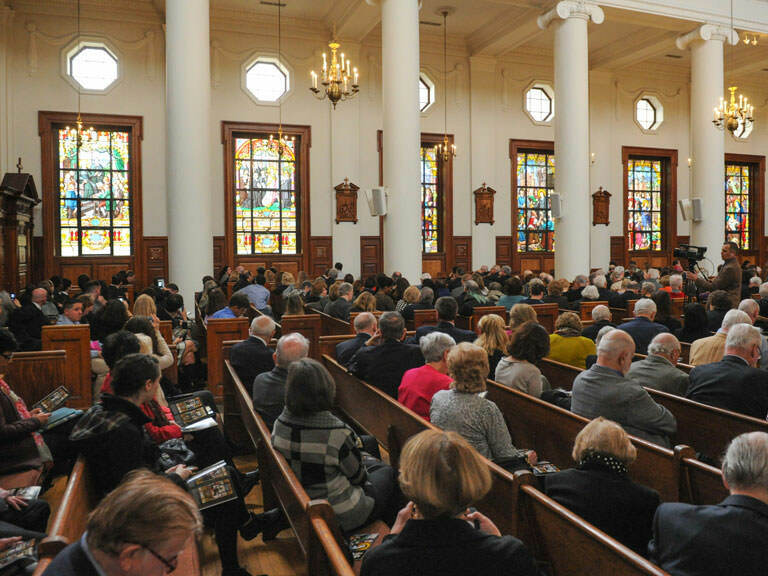 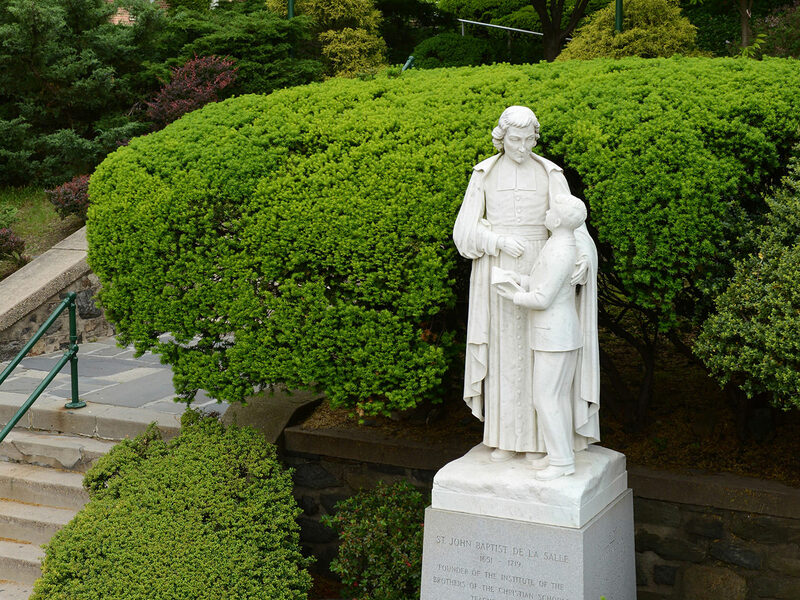 John Fiore ’17 shares his personal thoughts on the Lenten season, the second in a series of reflections from Manhattan College faculty, students and staff on their journey toward Easter. 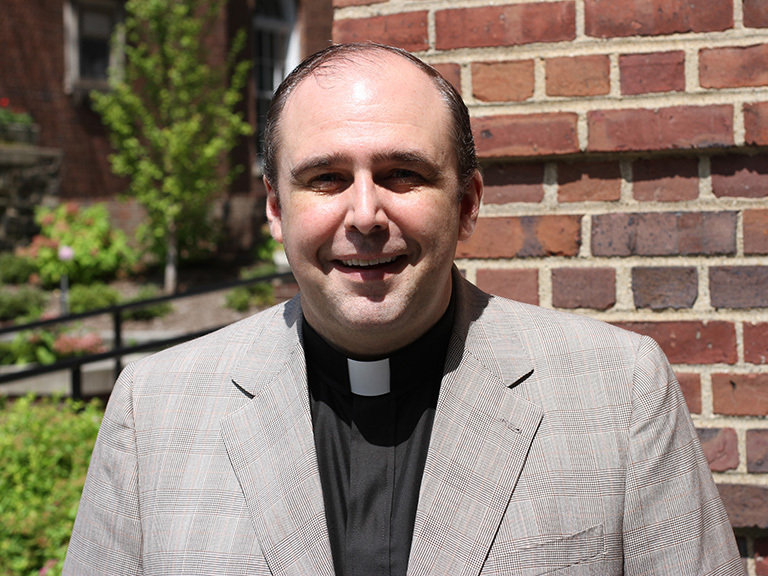 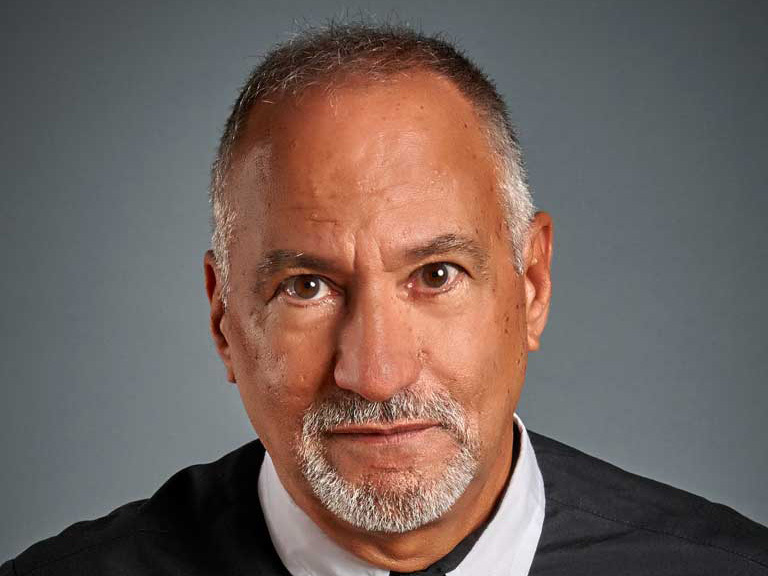 Brother Robert Bimonte, FSC, Lasallian in residence at Manhattan College, provides a reflection on Ash Wednesday. 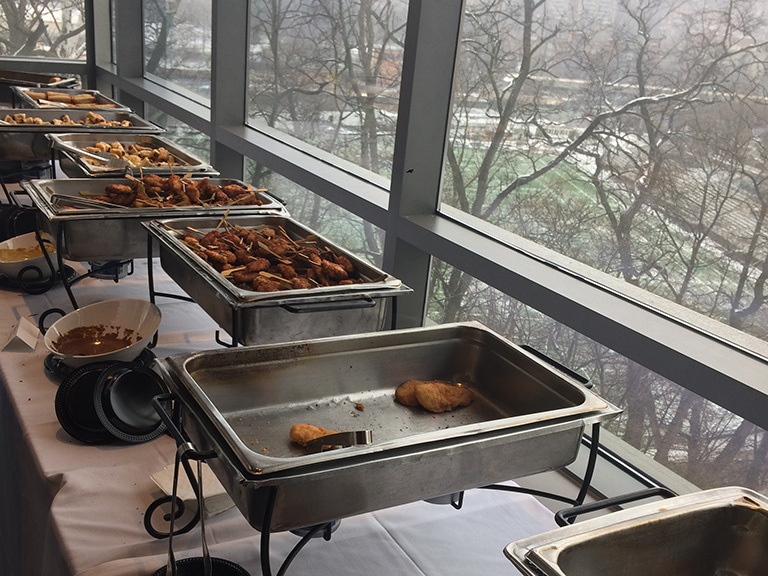 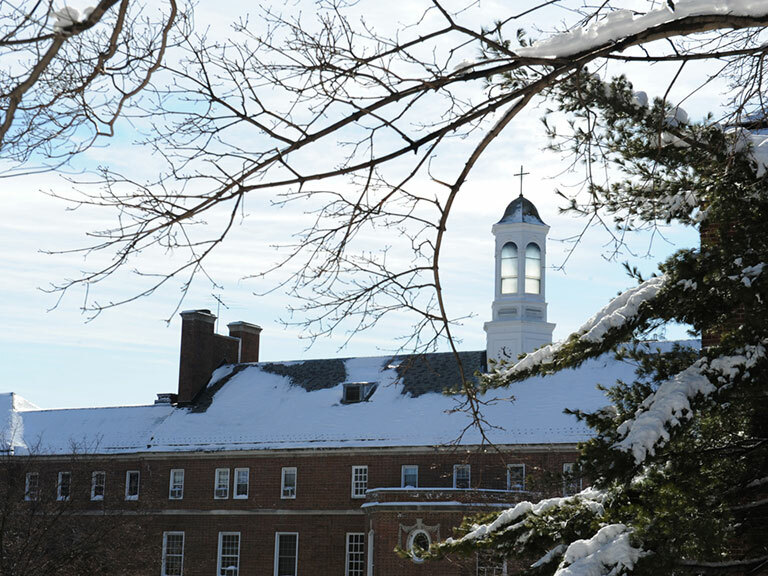 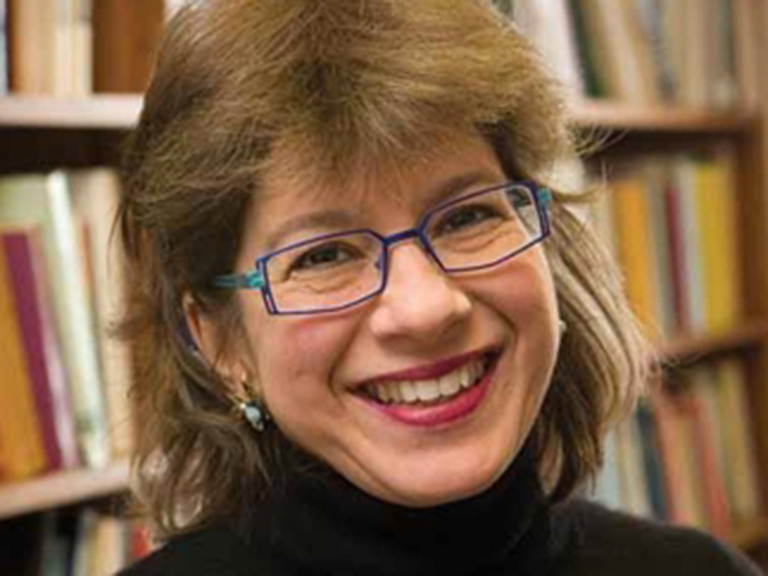 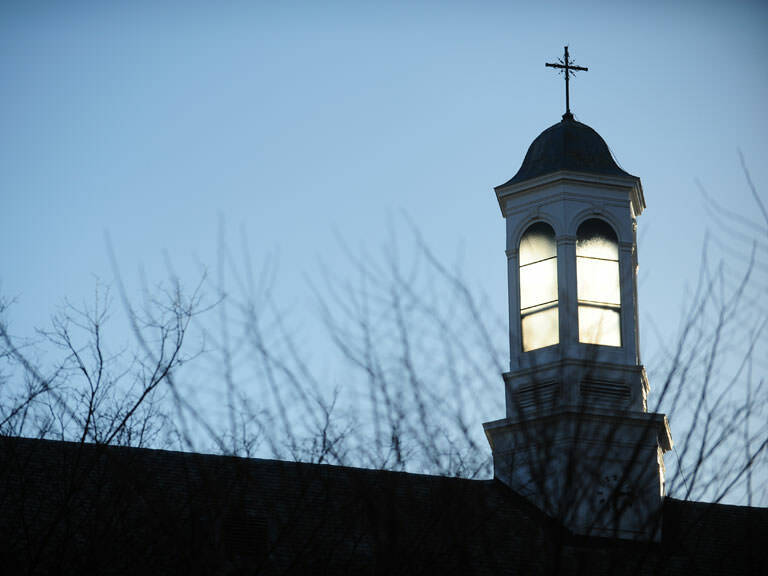 It is the first of a series of reflections from Manhattan College faculty, students and staff on their Lenten journey. 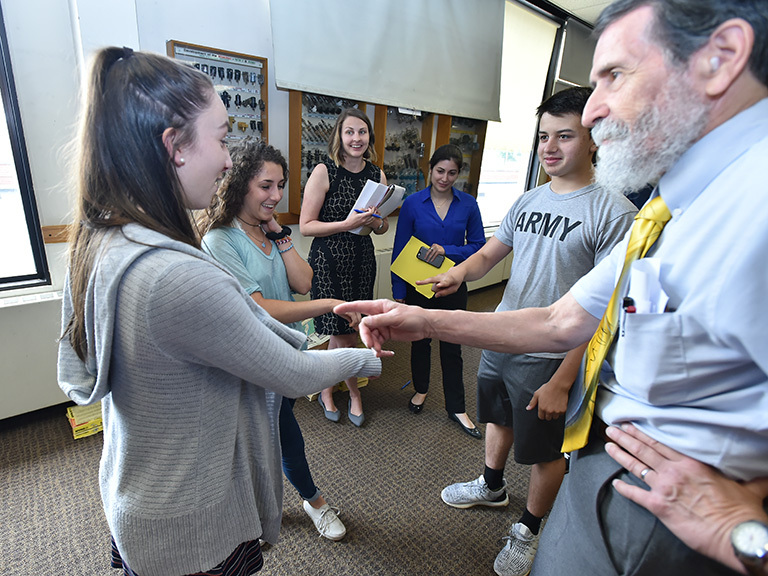 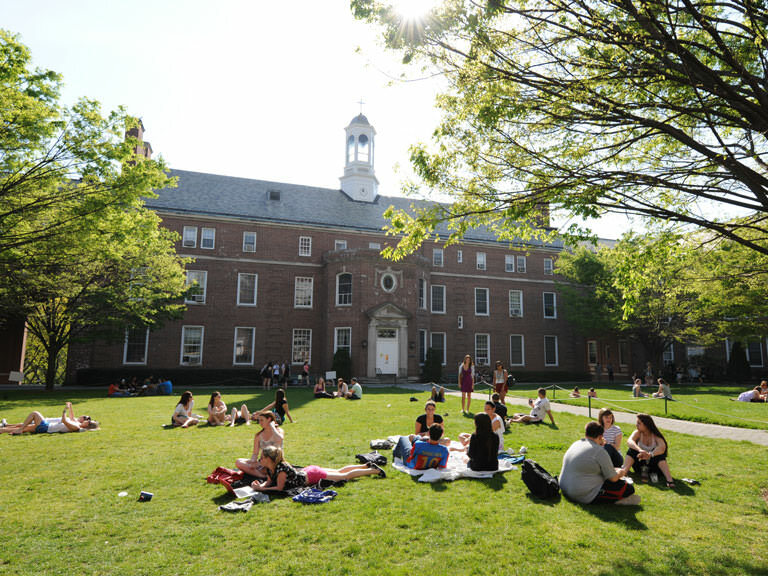 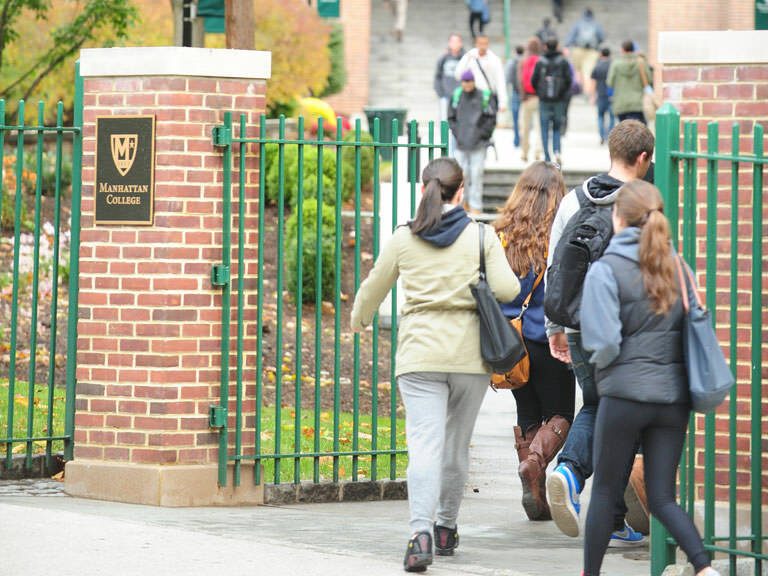 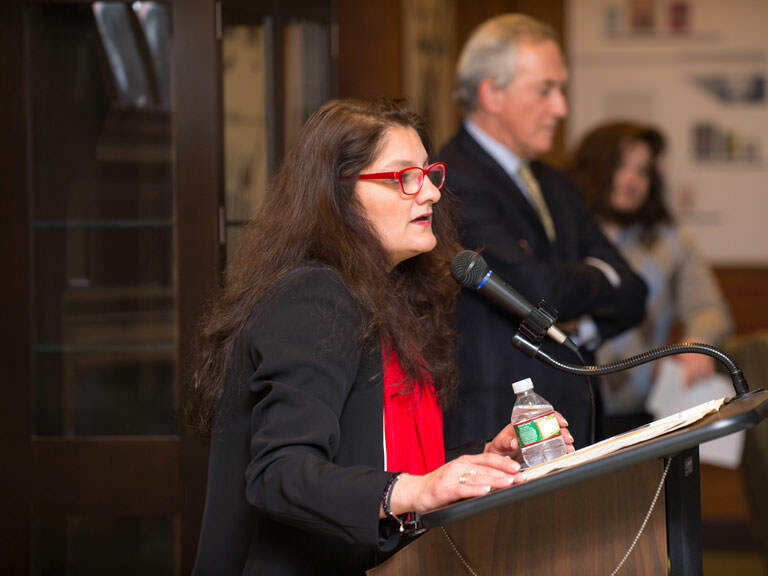 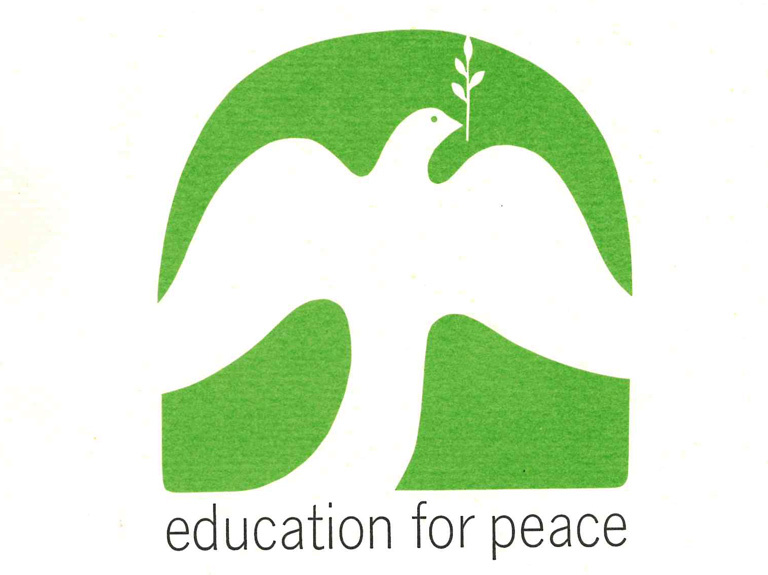 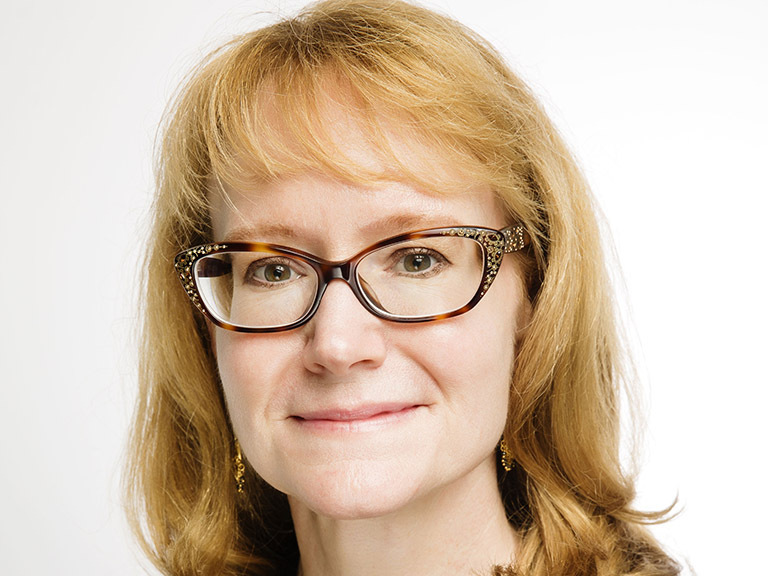 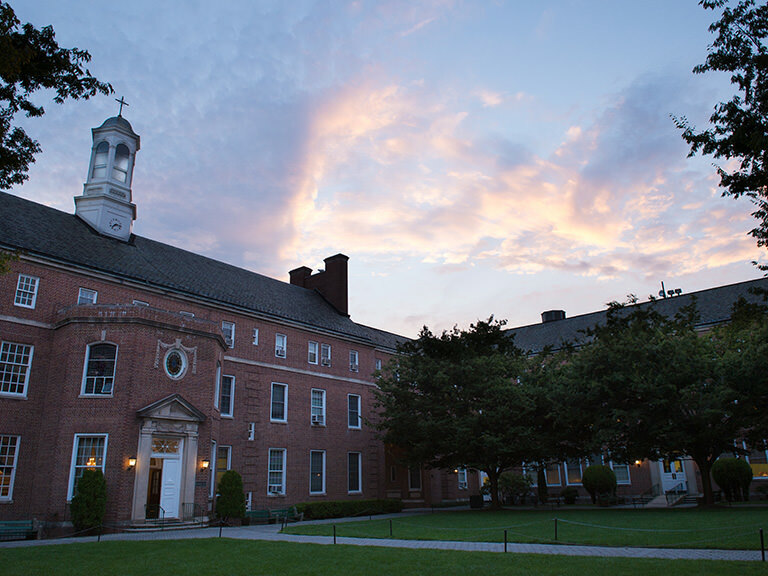 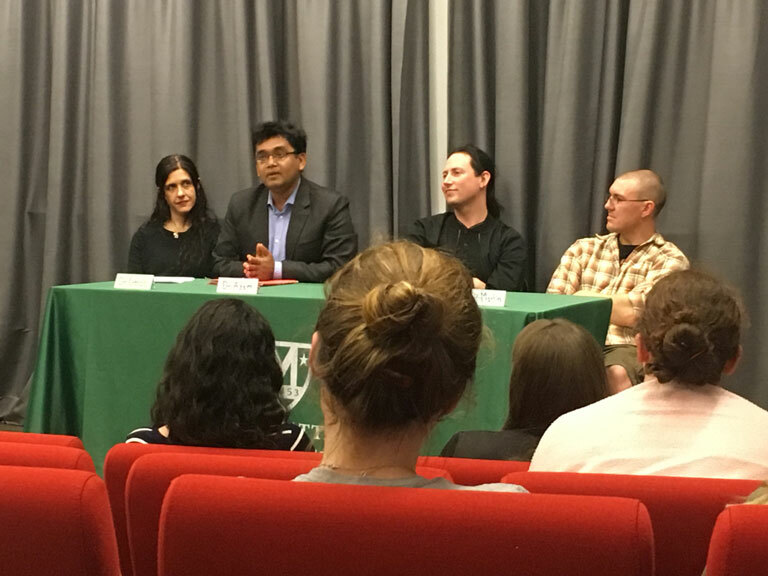 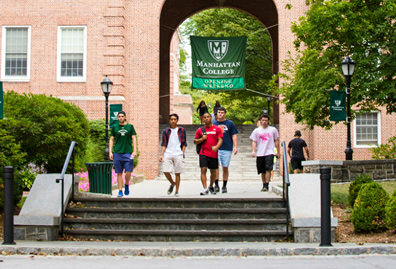 Manhattan College will host a series of events surrounding the antiwar movement. 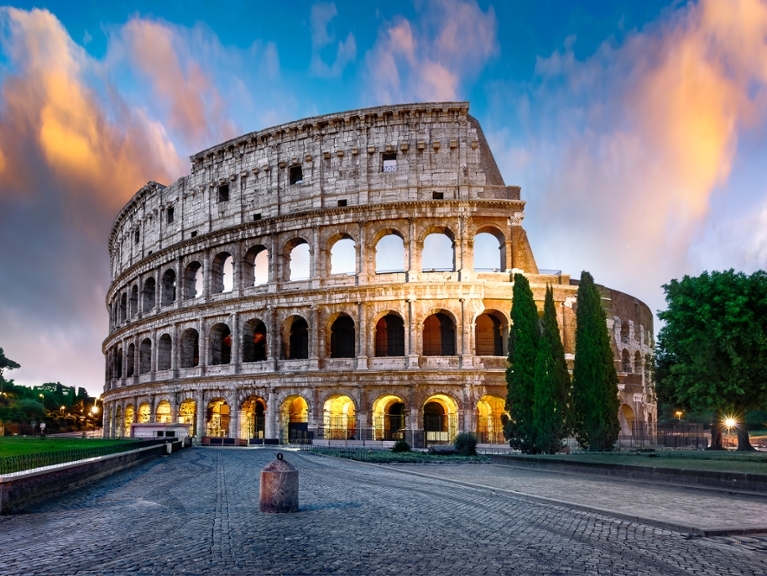 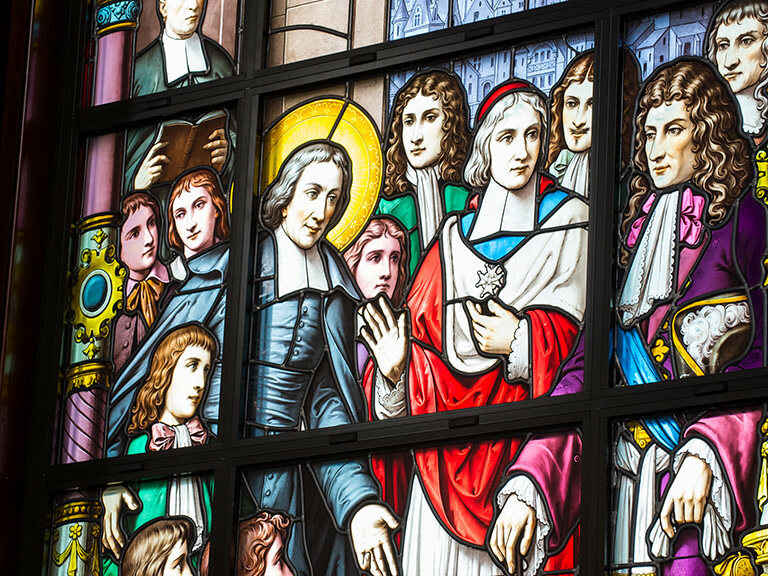 In December 2015, Pope Francis called for an extraordinary jubilee year, setting it apart from the ordinary cycle of jubilees, or holy years, which are called every 25 years in the Catholic Church. 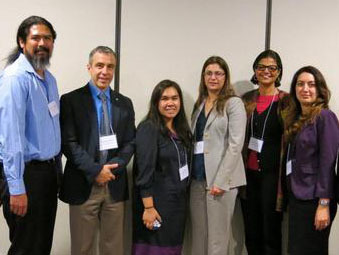 Twenty-four members of the Manhattan College community traveled to Saint Mary’s University of Minnesota for the fifth annual International Symposium on Lasallian Research in September. 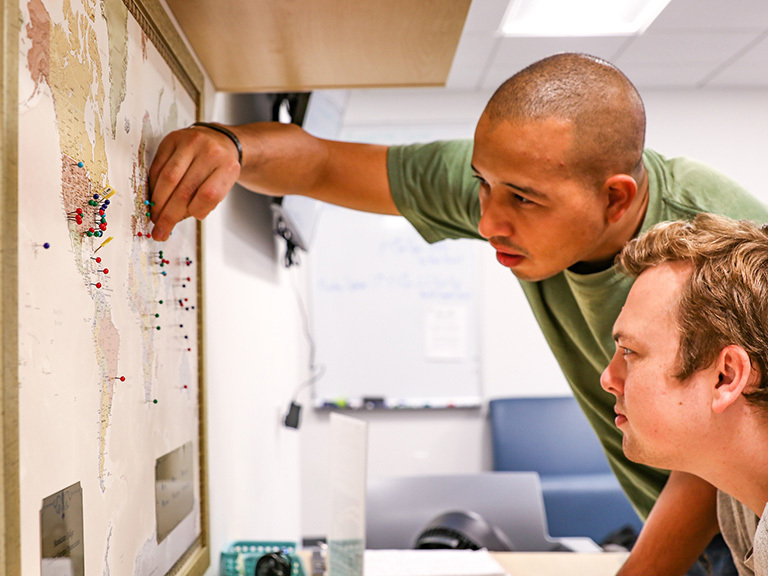 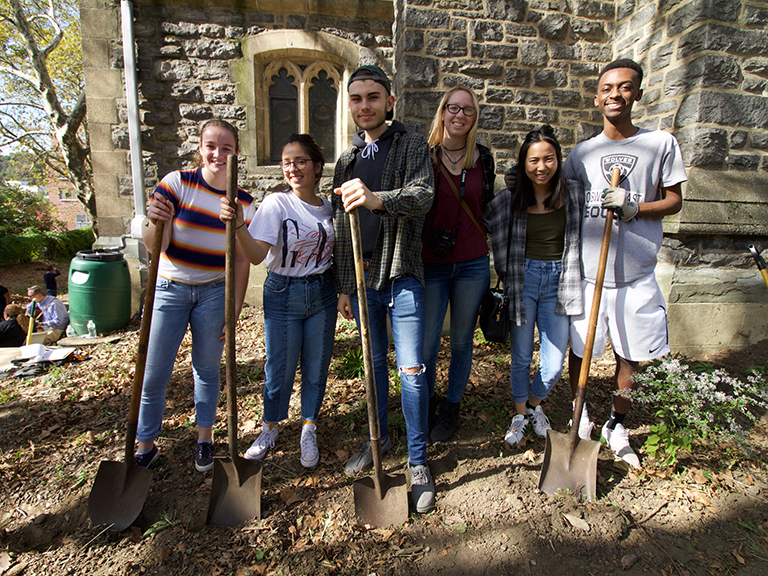 Two things Manhattan College is well known for – social action and its engineering program – came together this summer to help solve water issues around the world. 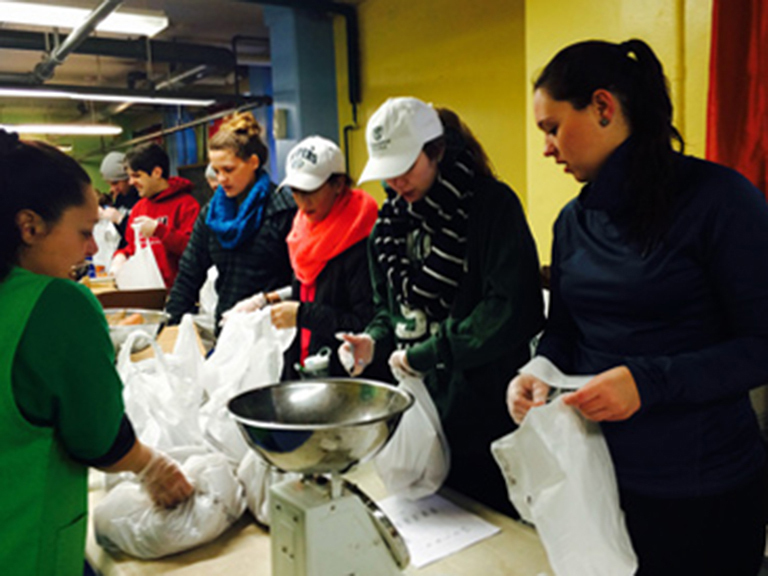 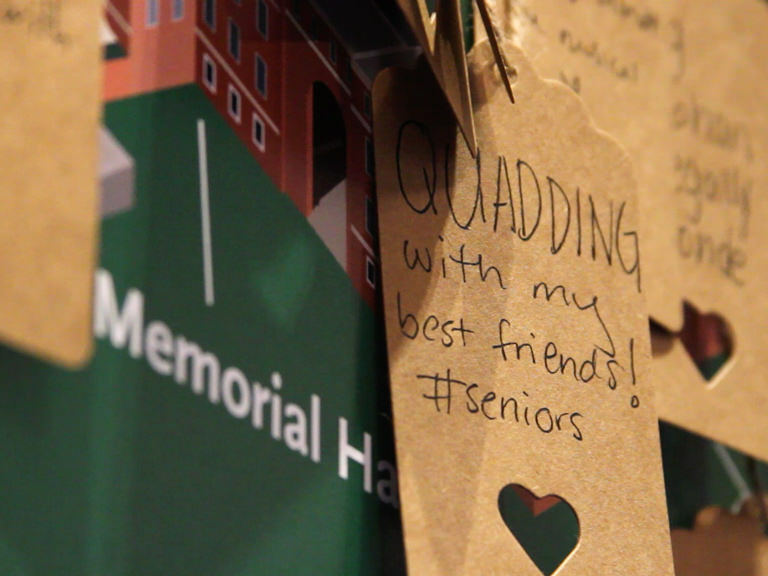 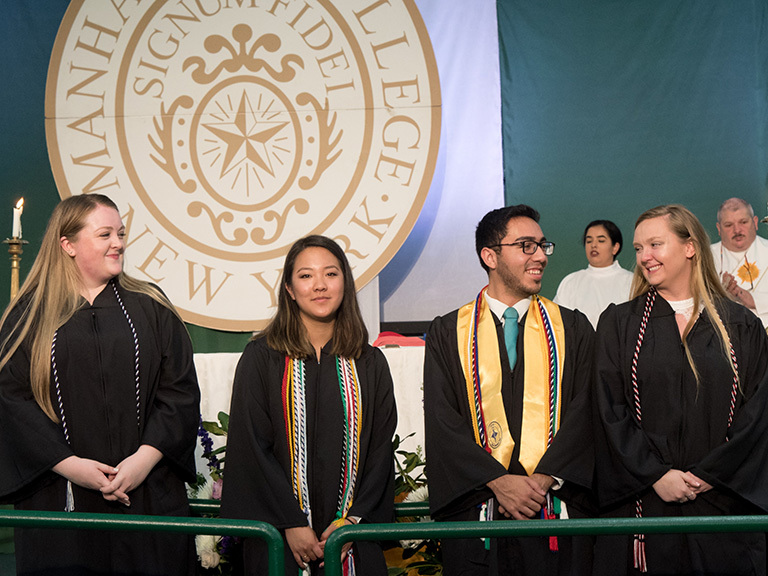 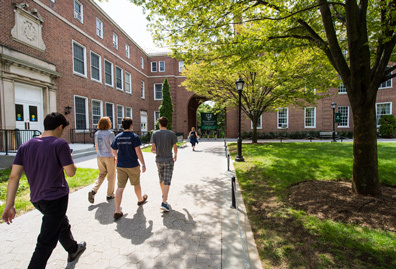 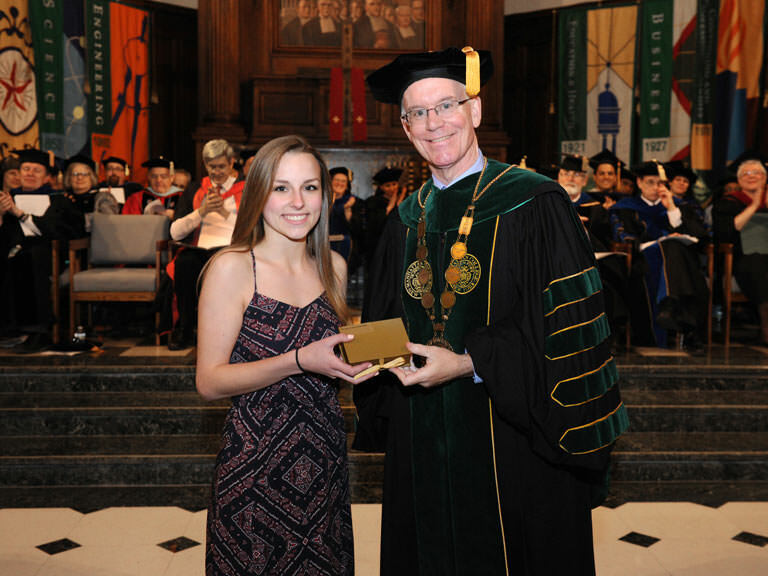 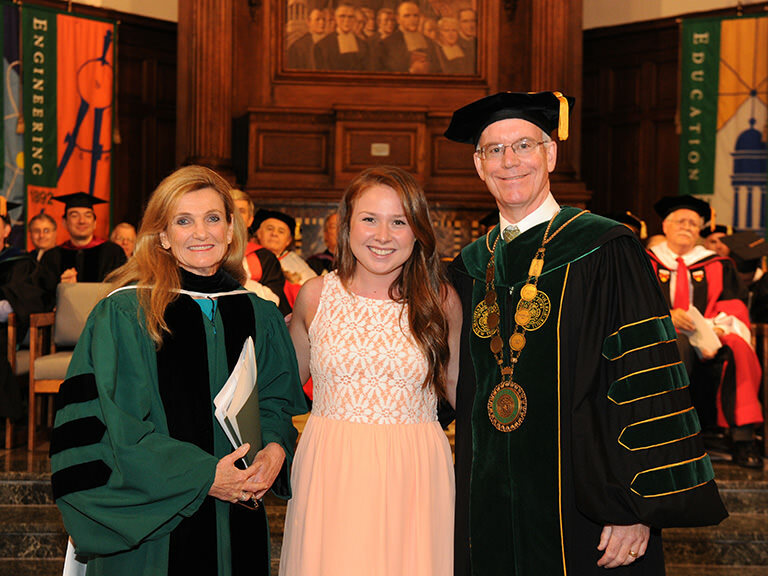 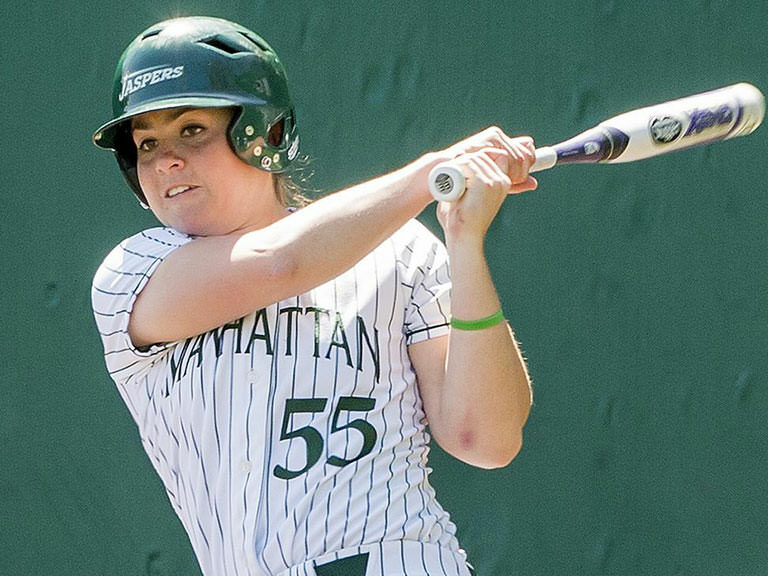 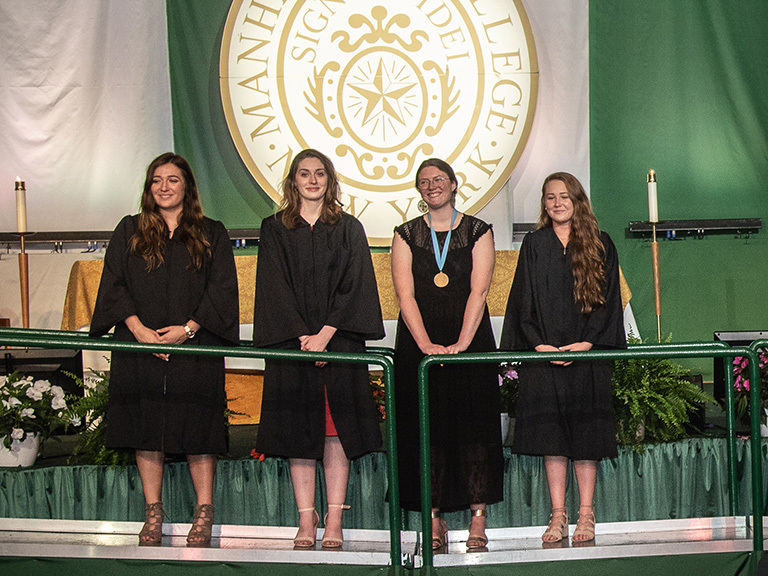 Manhattan College students will serve in the Lasallian tradition following Commencement. 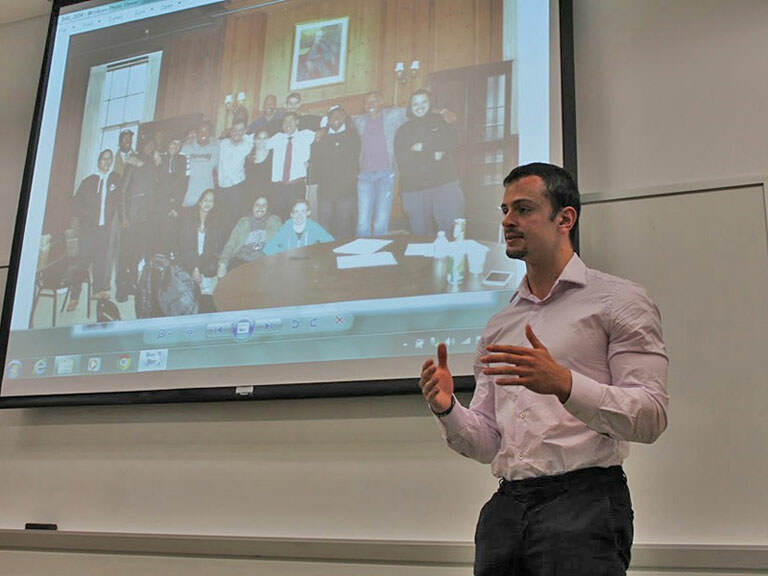 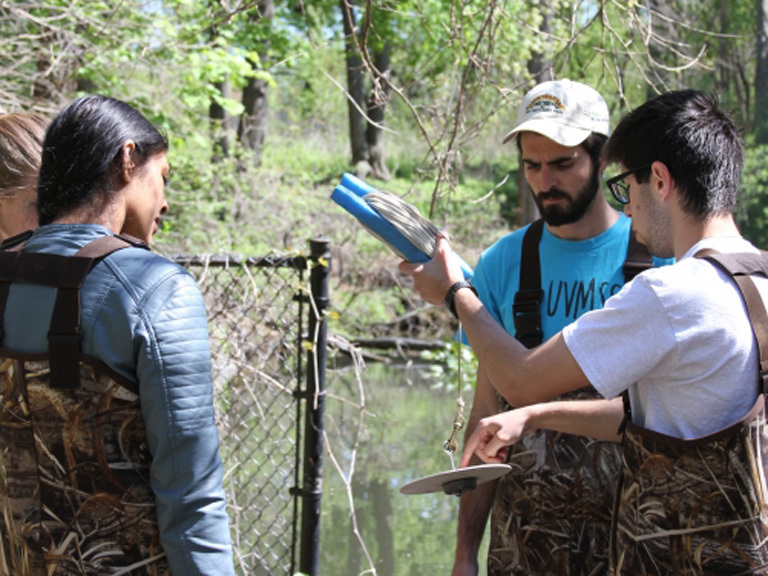 John Abbatangelo '16 and civil and environmental engineering professors are partnering with The Friends of Van Cortlandt Park to contribute to the Wetland Stewardship for a Healthier Bronx project. 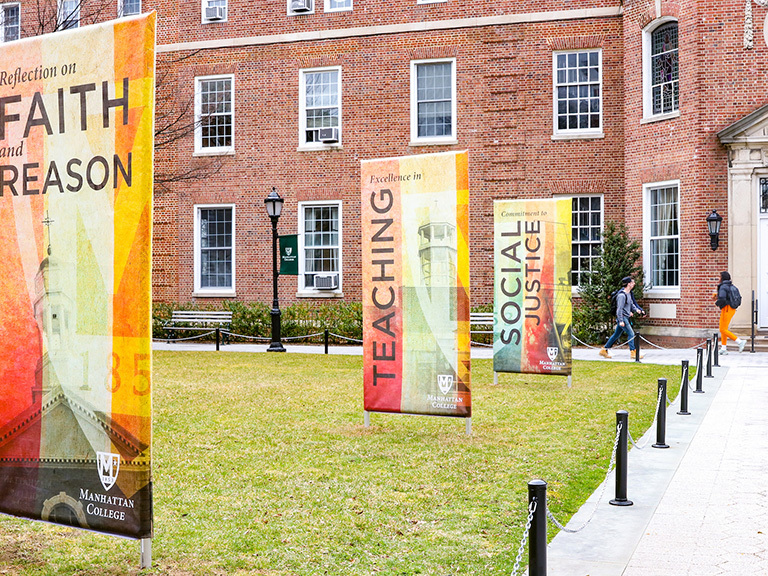 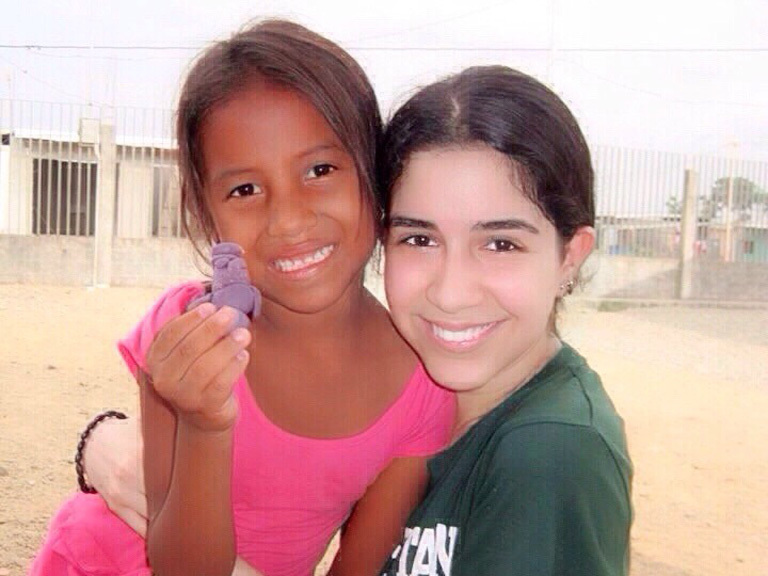 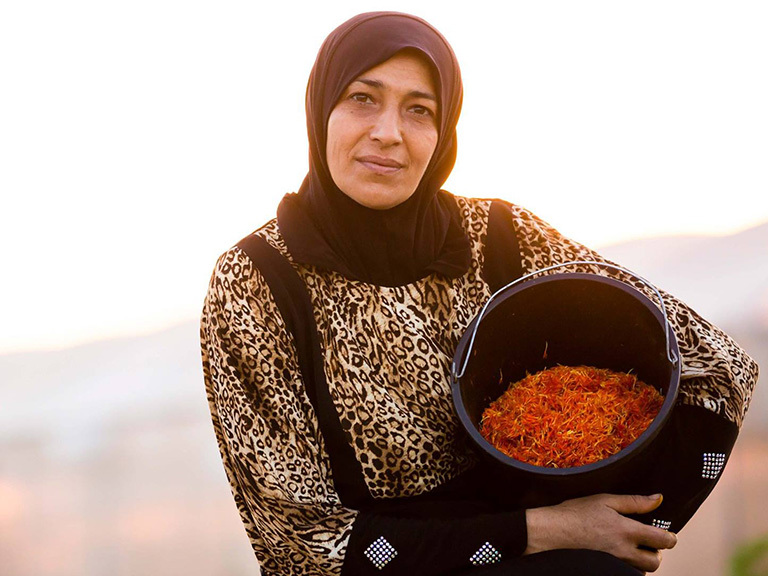 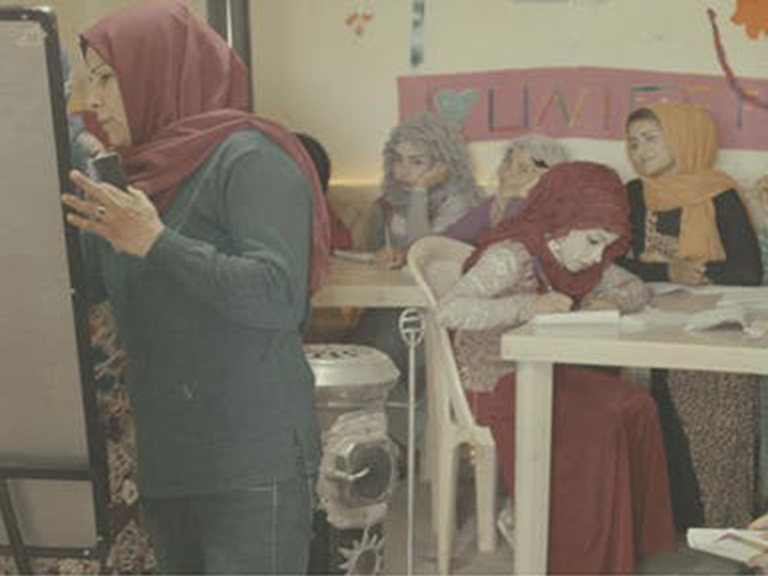 Faculty, students and alumni are making a difference in a wide range of settings, locally and globally. 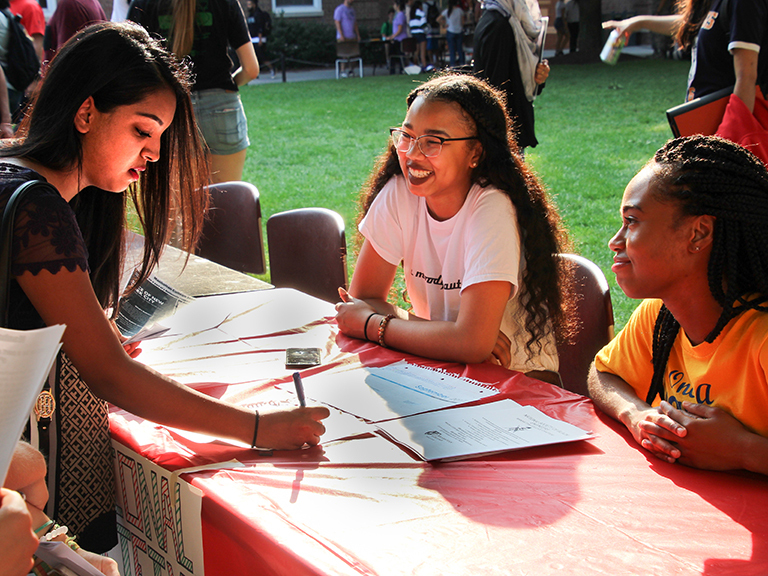 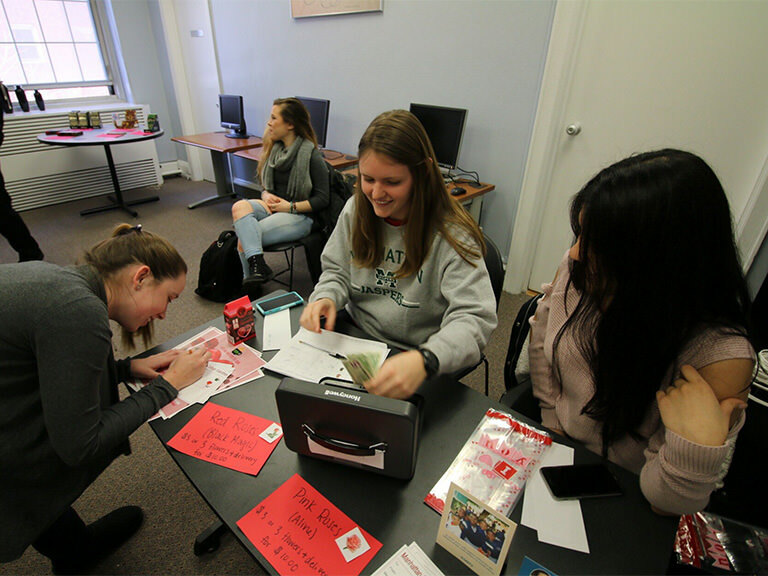 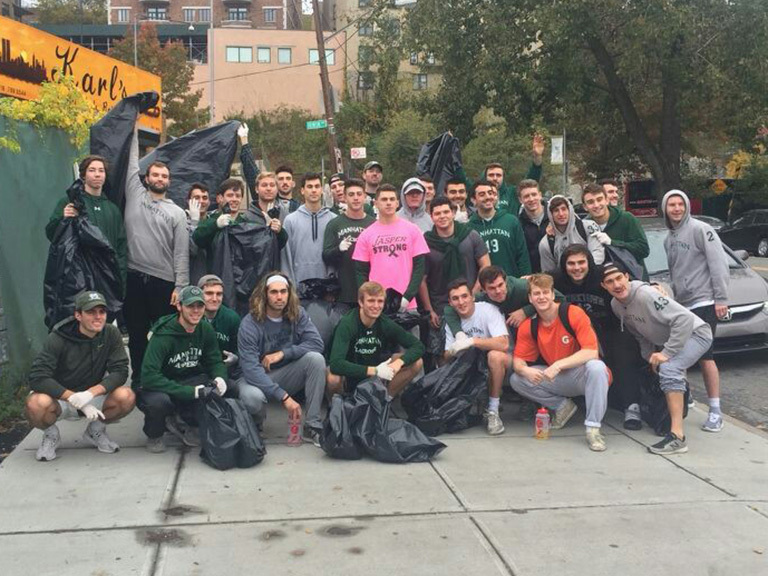 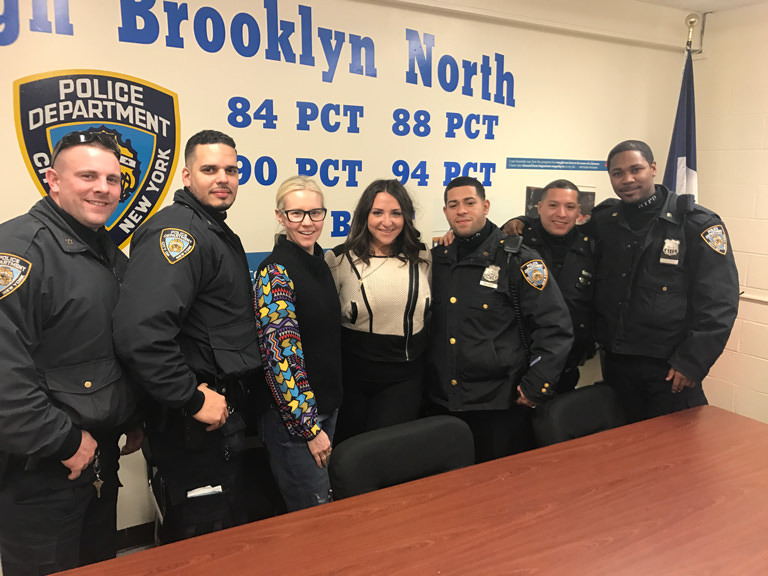 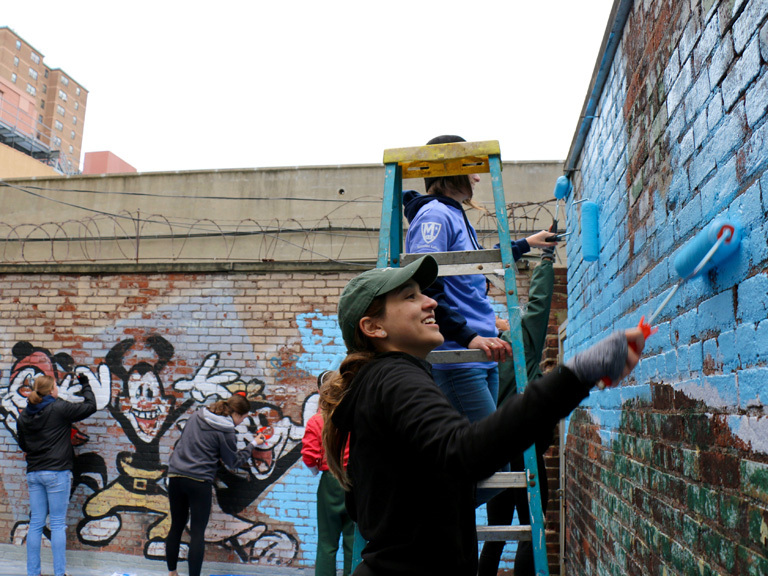 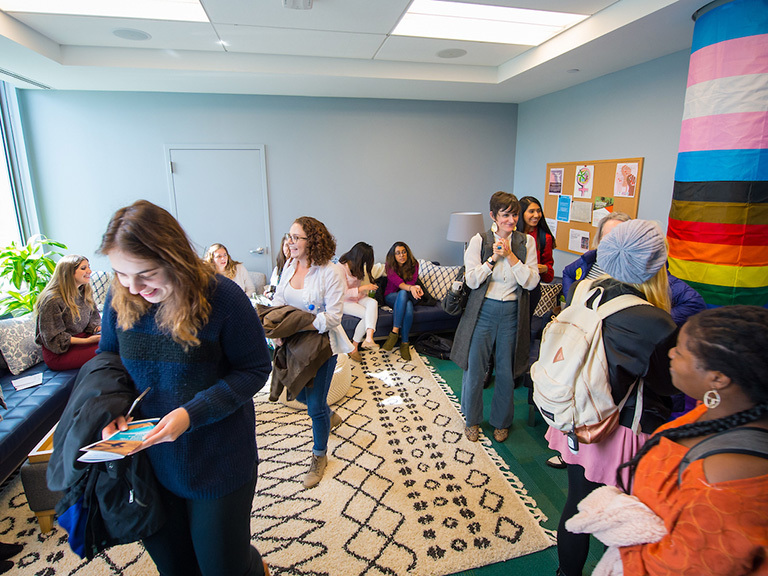 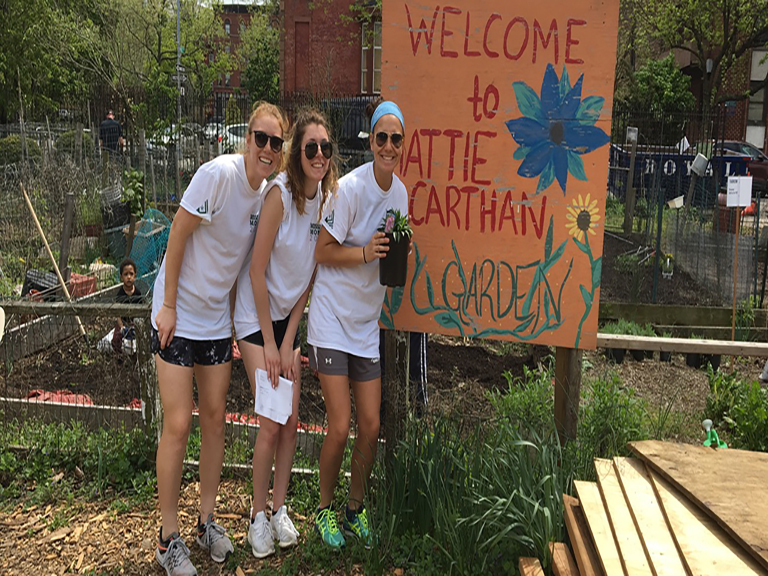 Manhattan’s alumni magazine, M, and the Mentor Program brought together three likeminded communication majors to give back. 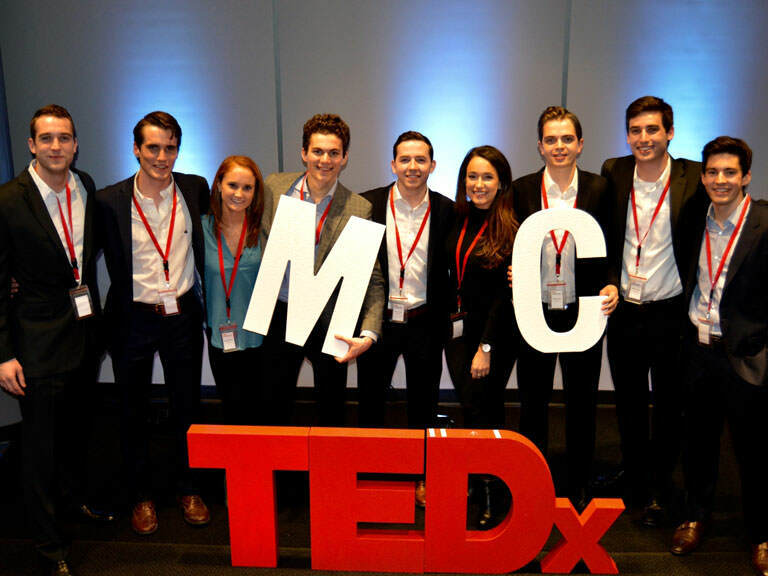 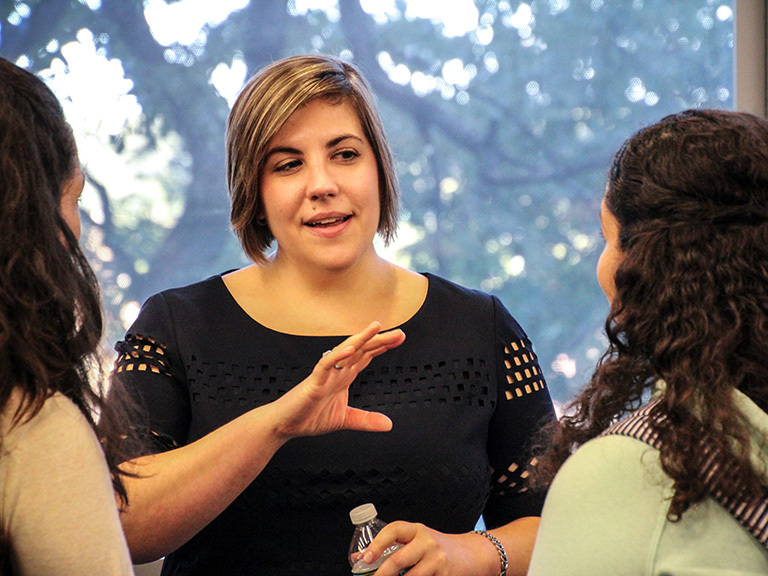 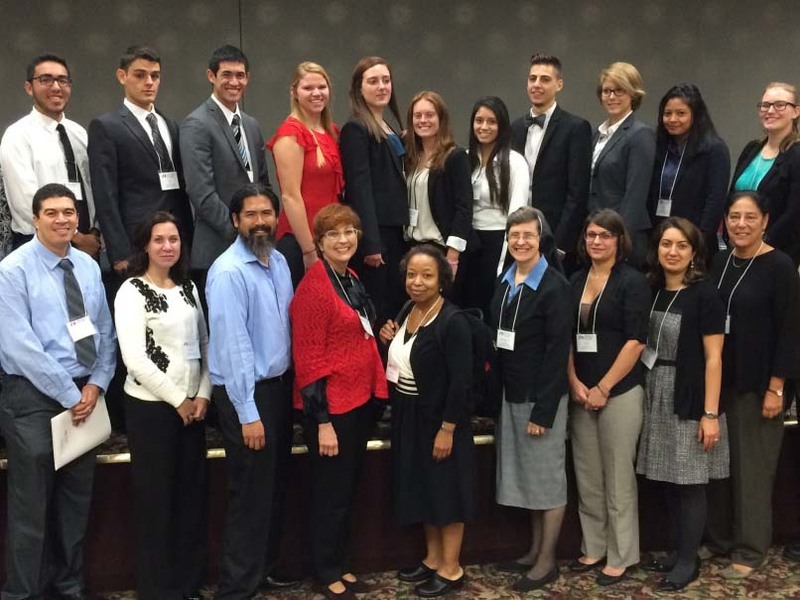 Thirteen Manhattan College students recently presented their research projects at the 2015 Saint Mary’s University International Symposium on Lasallian Research in Minneapolis. 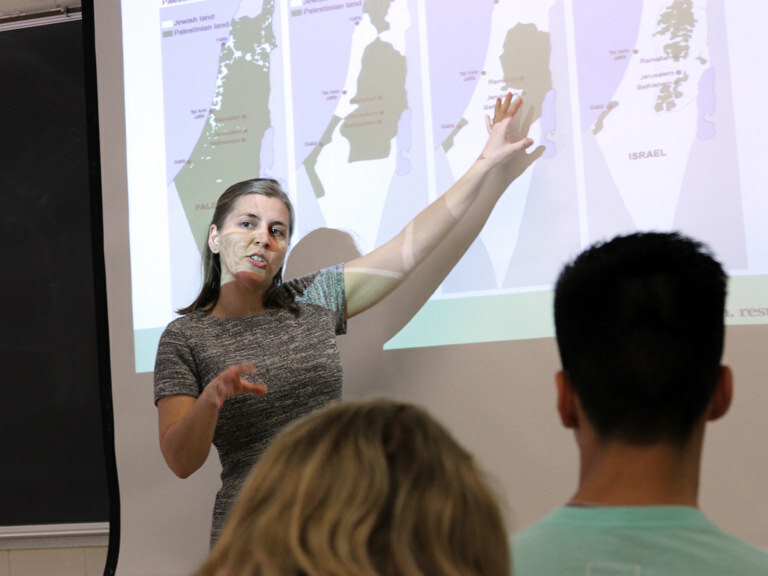 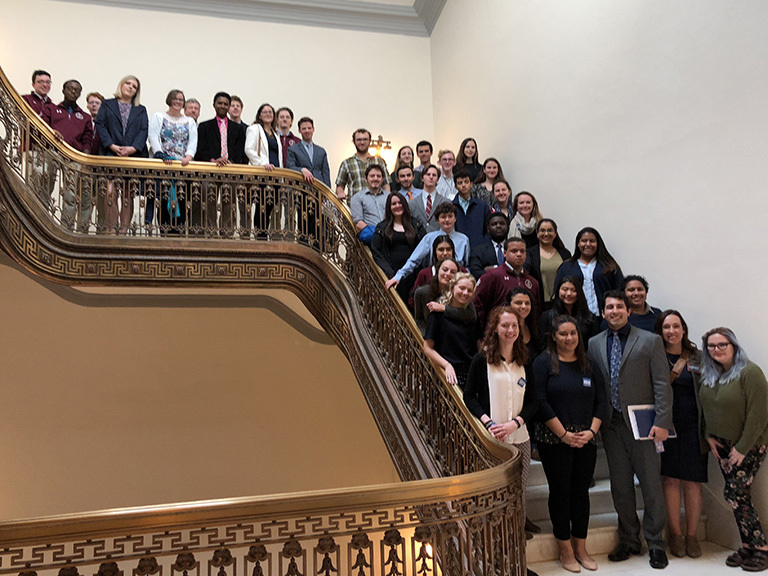 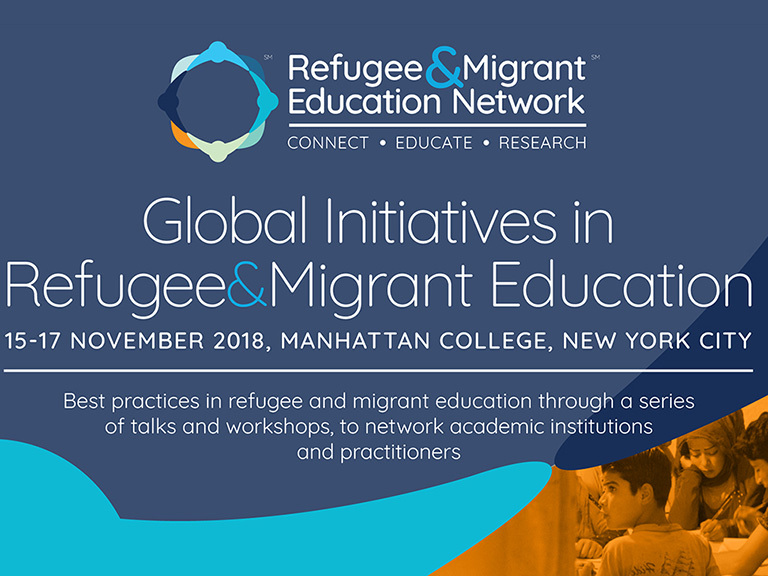 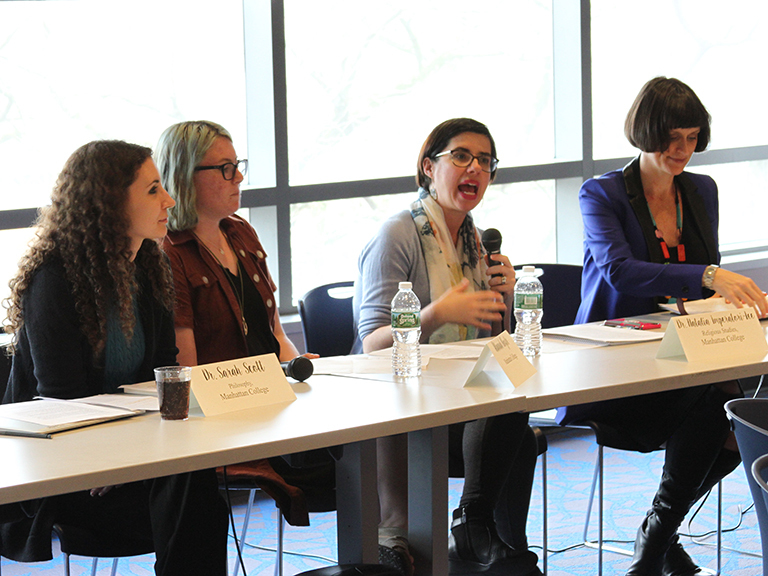 In addition, several Manhattan professors attended the conference to share their research and findings along with the students from Sept. 27-29. 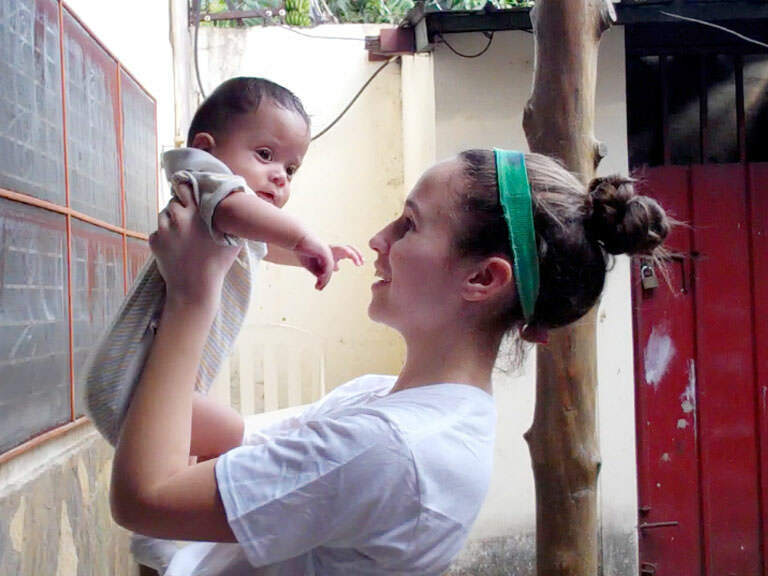 Serving a rural village in Central America, Melissa (Blythe) Altman ’06 and her family are operating programs for local children in an effort to better their futures. 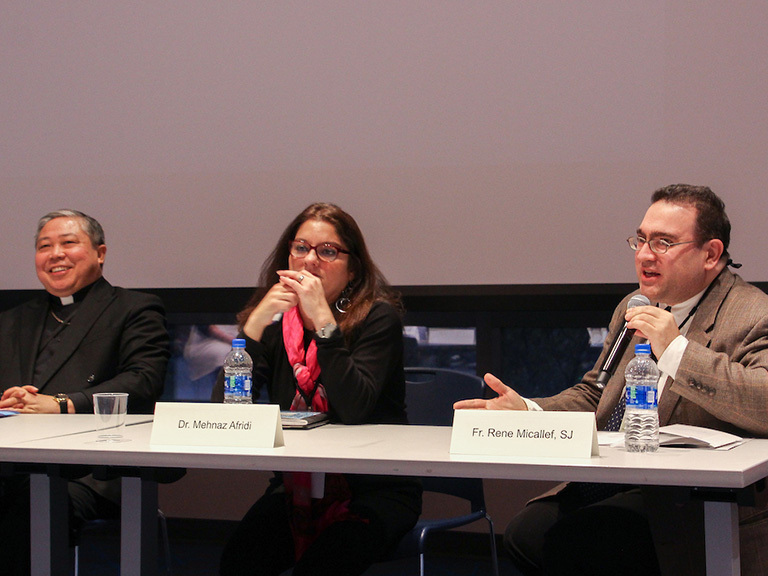 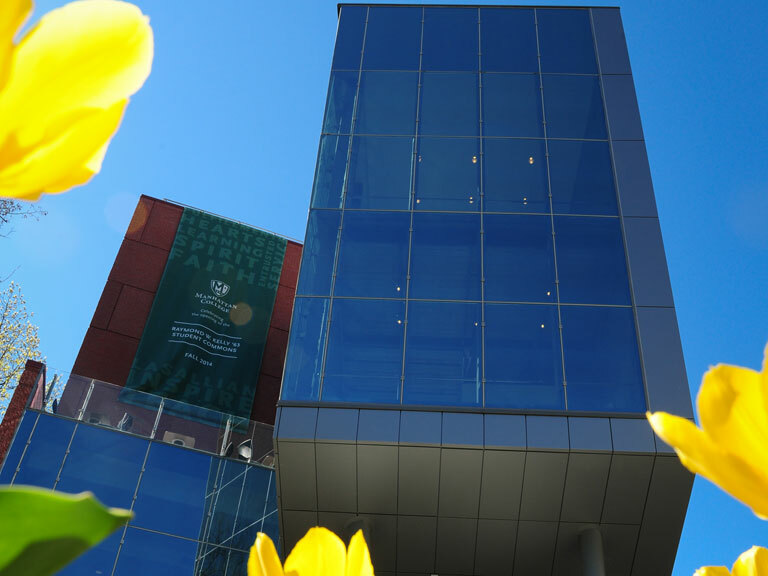 The School of Science and CURES to host events beginning on April 15. 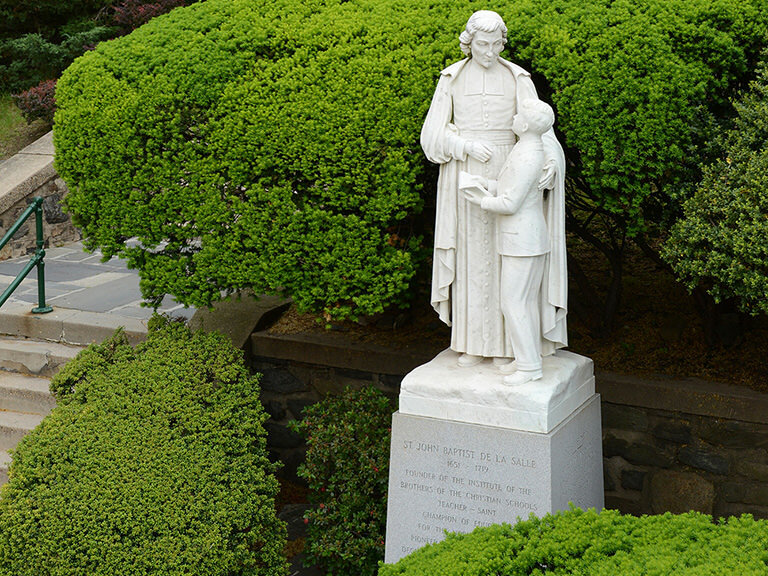 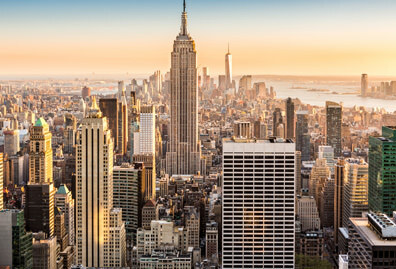 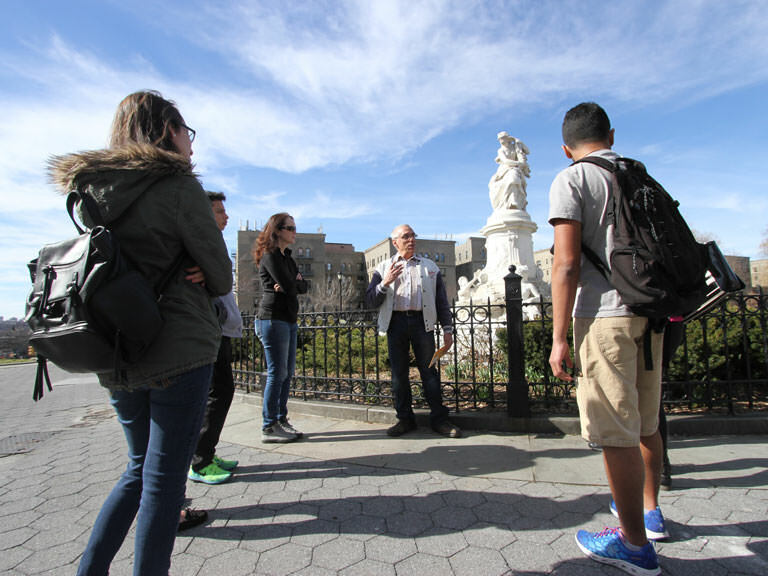 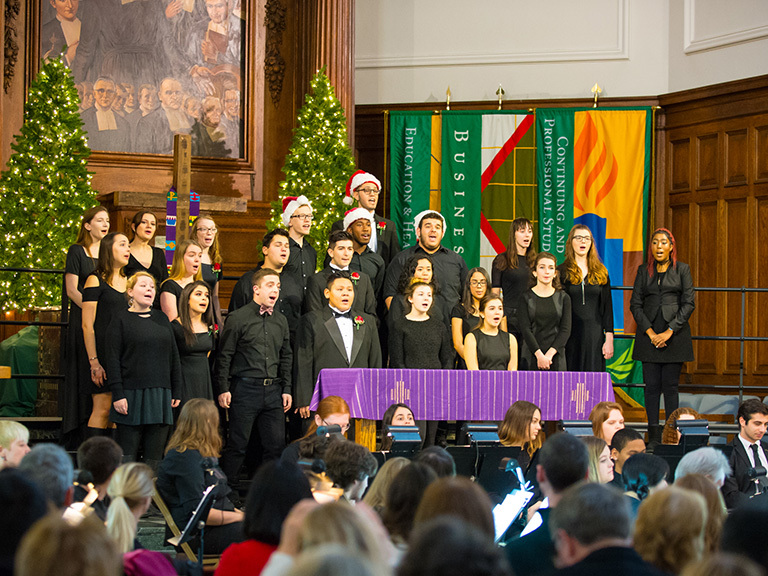 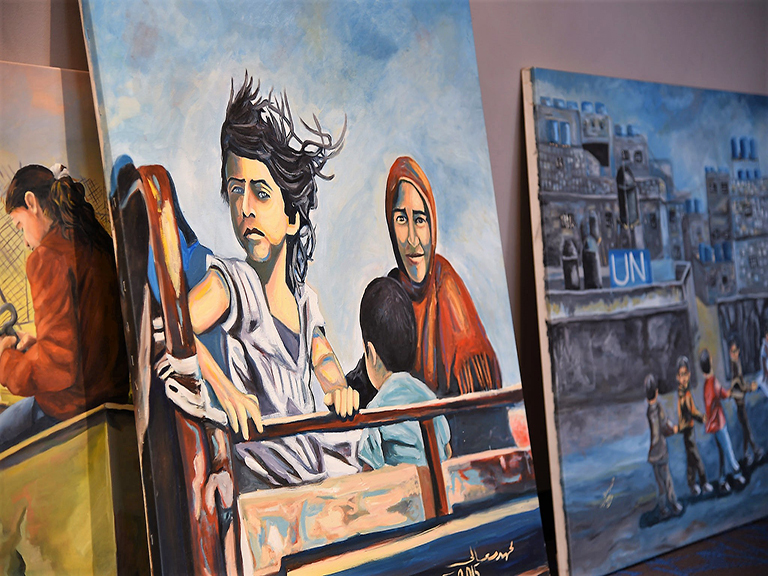 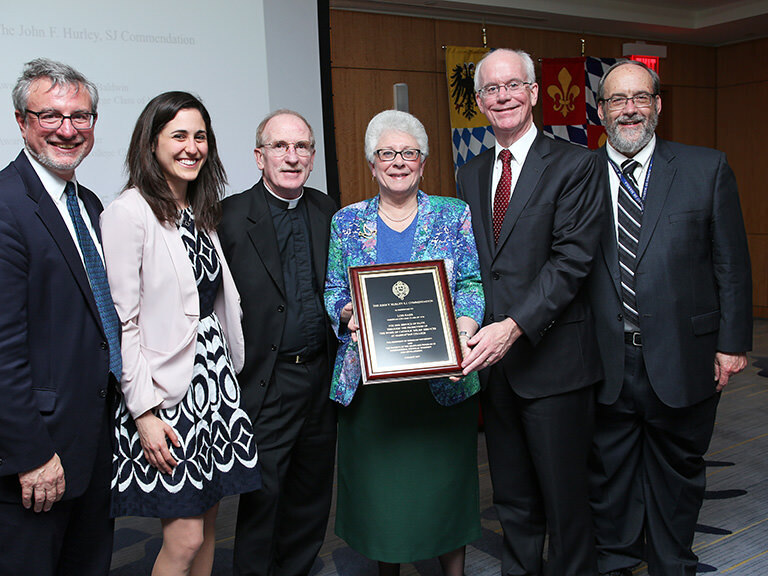 As the campus celebrates Mission Month this April, the College reflects on some of Manhattan’s many mission-inspired works that occurred throughout the year. 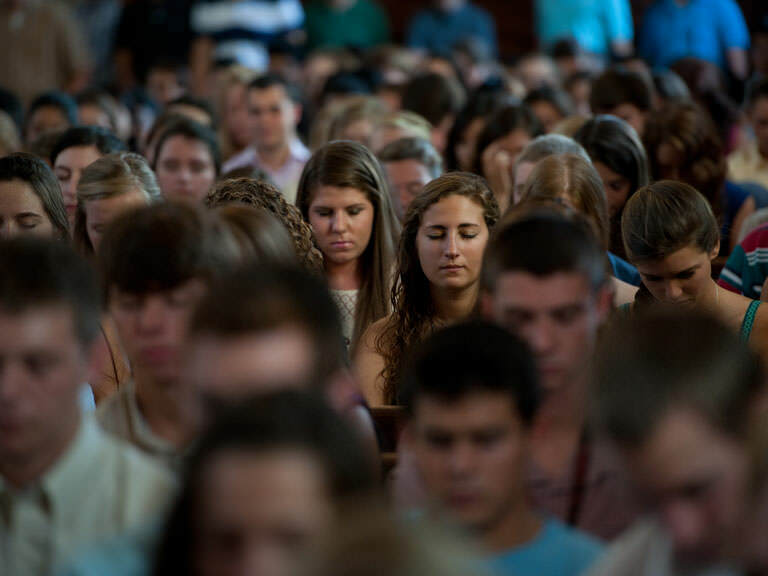 The new Campus Ministry event series seeks to foster discussions about faith. 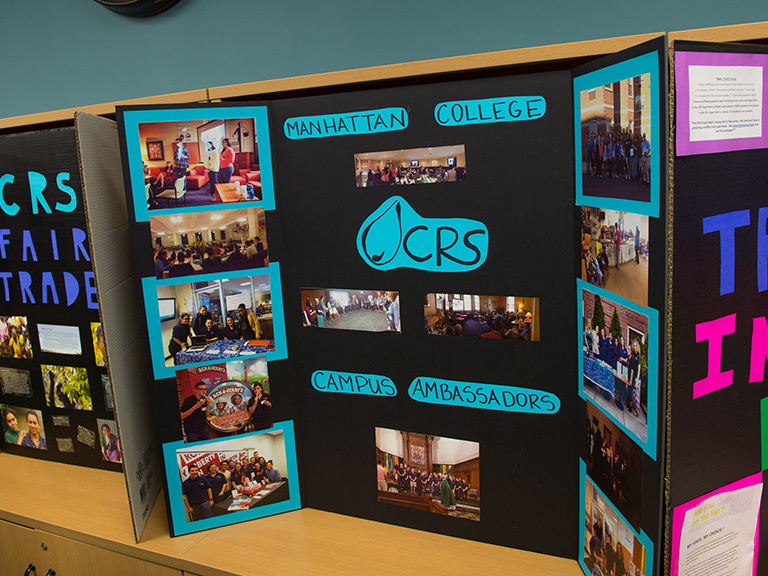 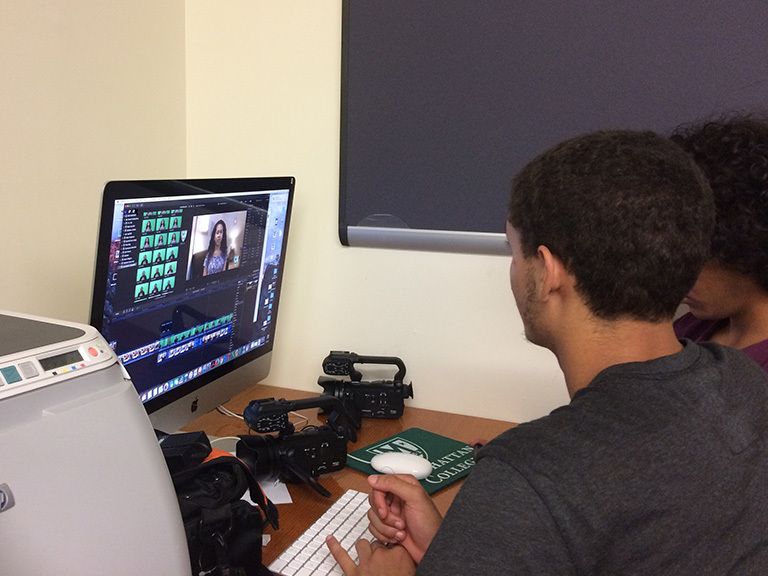 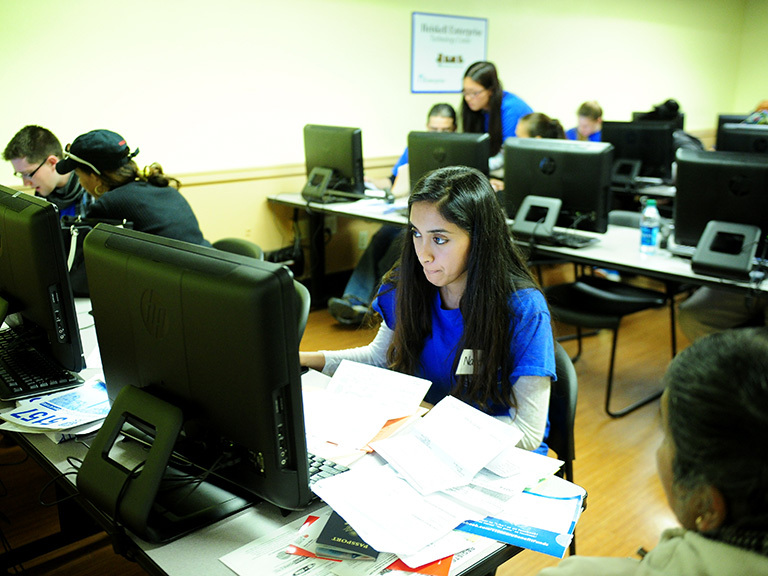 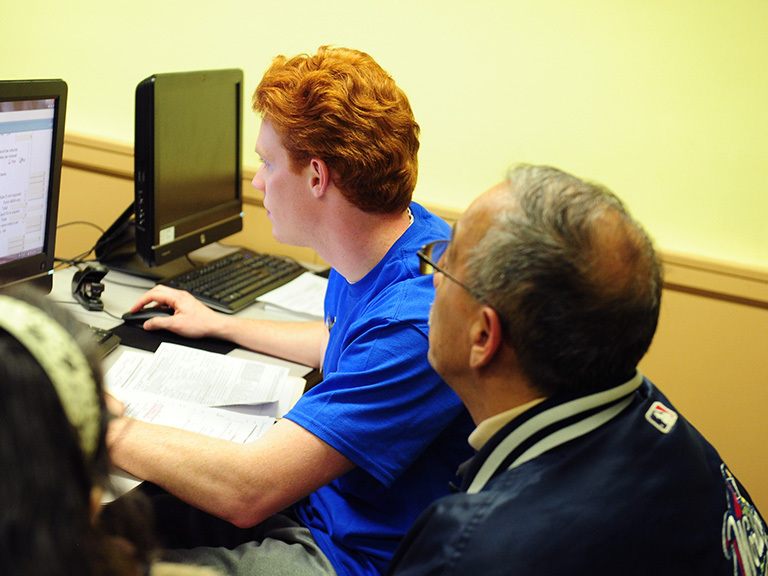 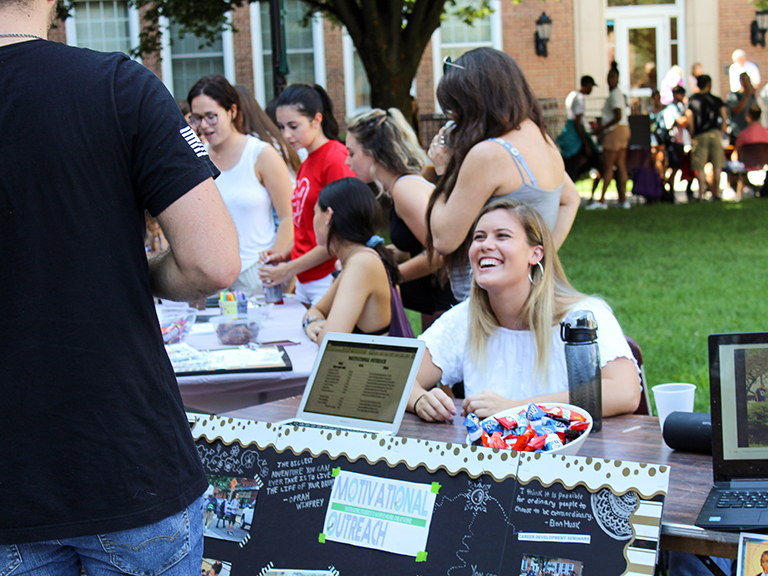 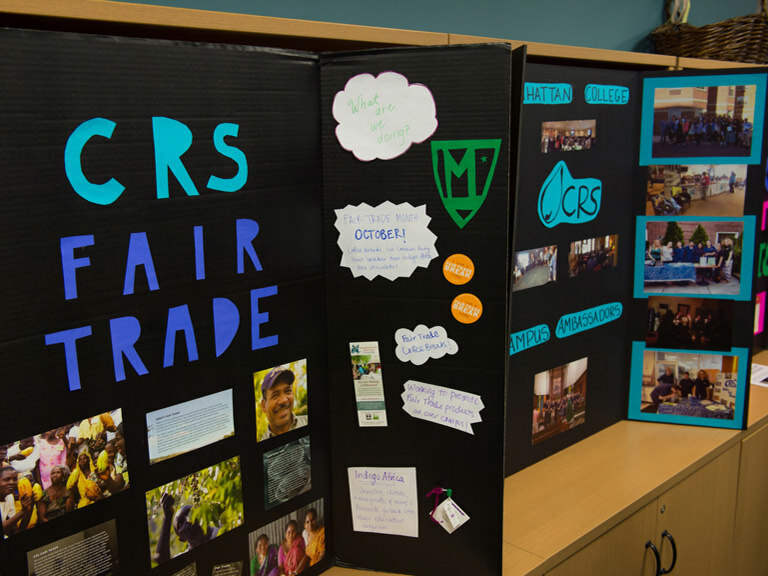 The College’s Campus Ministry and Social Action office is working to expand local service programming for students. 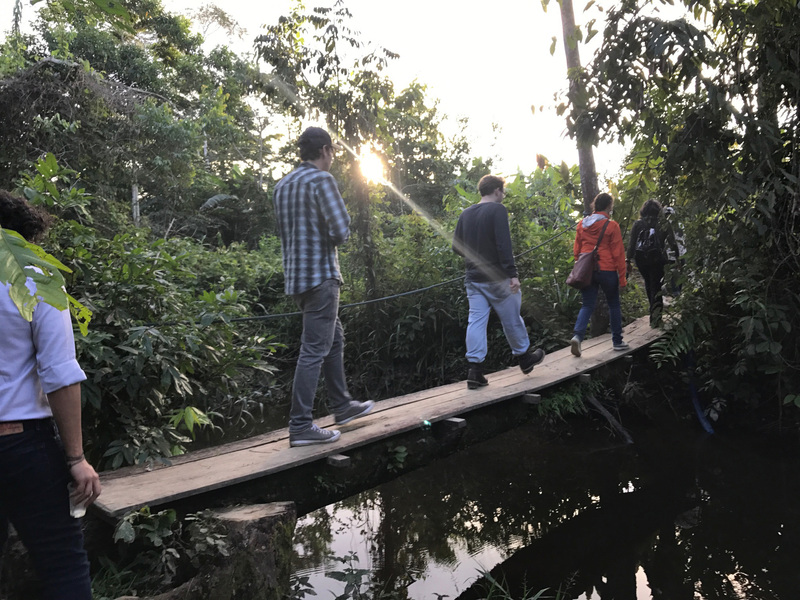 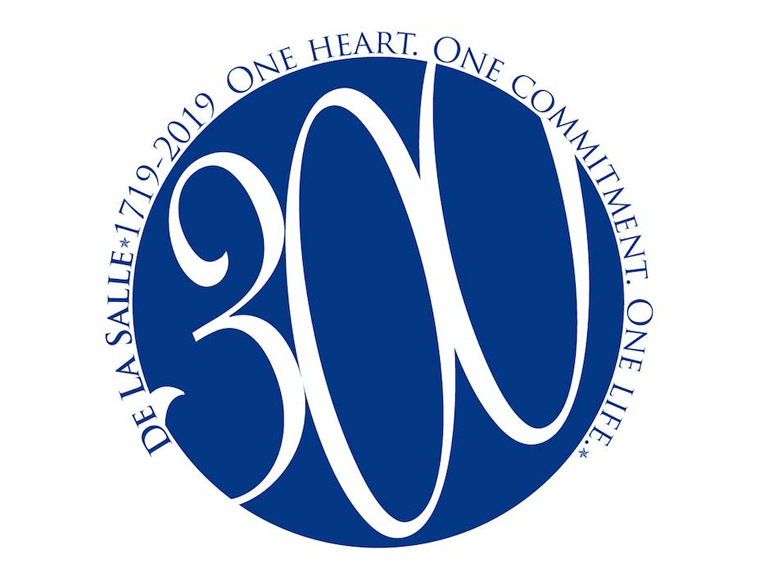 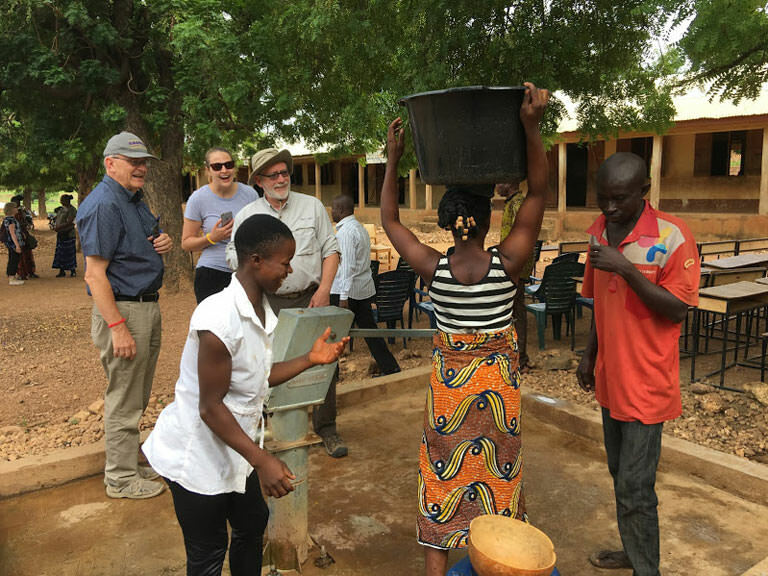 Using their expertise on water filtration systems, two students and their professor visited a Lasallian school and Brothers community to advise on infrastructure. 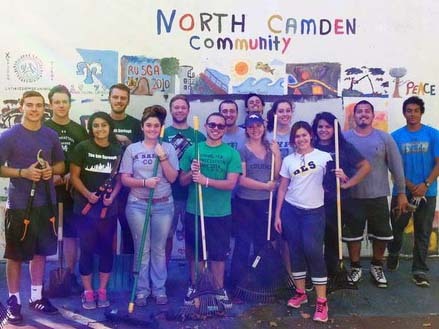 Manhattan College’s Lasallian Leaders who were in town as part of a three-day service retreat with De Sales Service Works this fall. 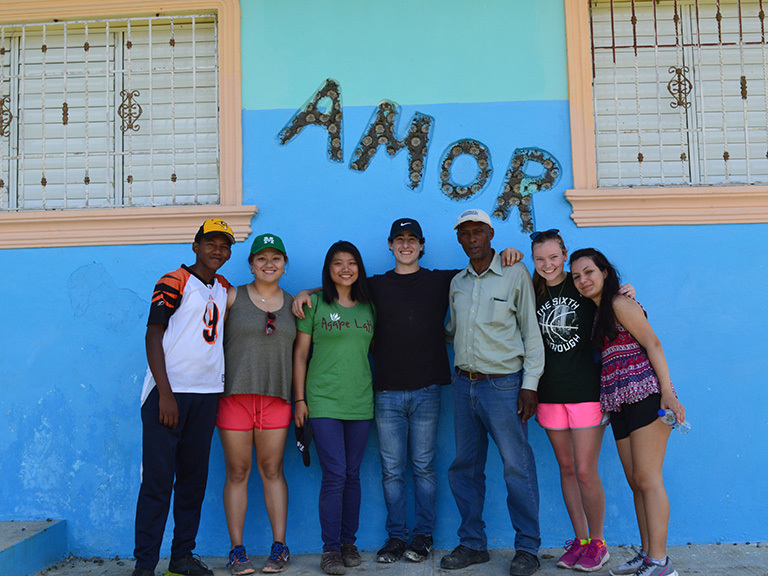 By cleaning streets and renovating parks, 16 students worked to instill hope in a community where potable drinking water is scarce. 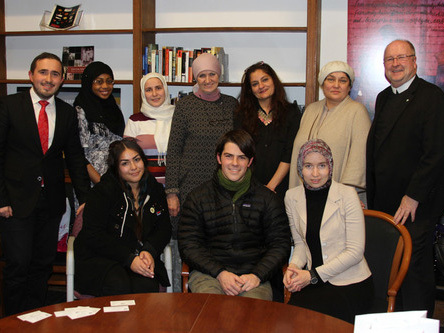 In an effort to combat anti-Islamic propaganda, the College welcomed a Russian delegation working to advance the rights of Muslims in Russia. 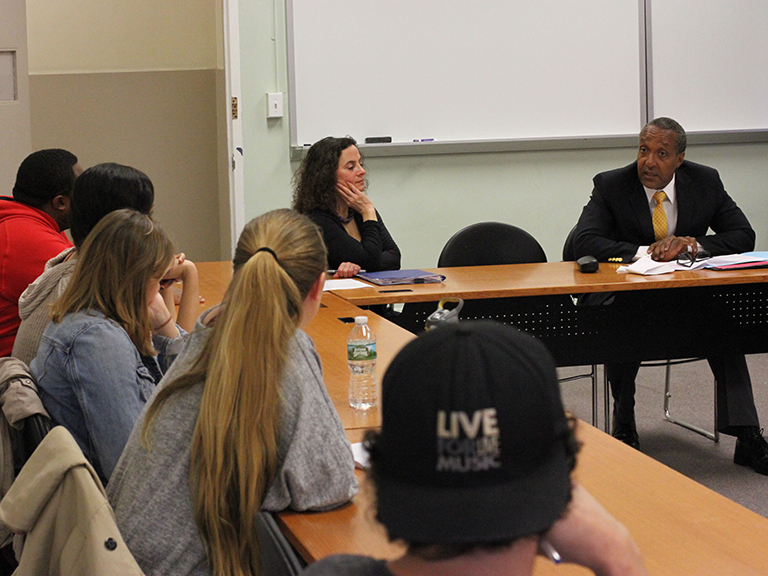 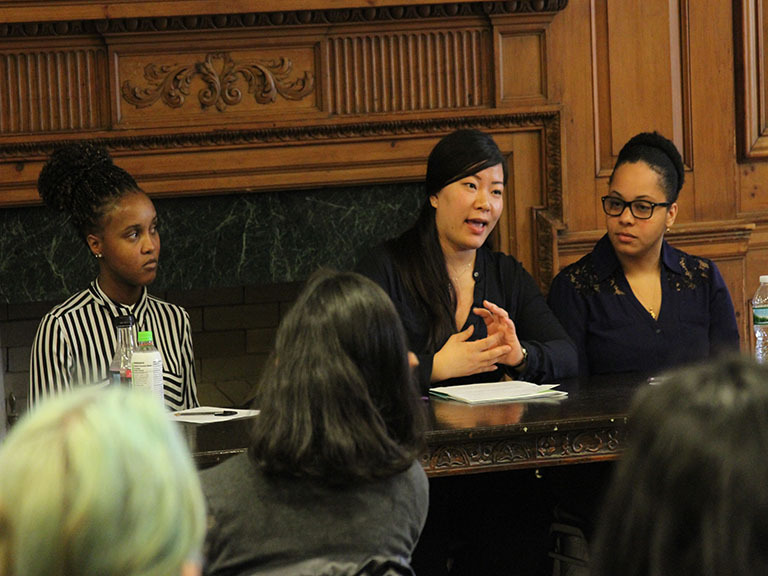 Students, faculty and administration joined them for a campus tour and roundtable discussion in O'Malley Library. 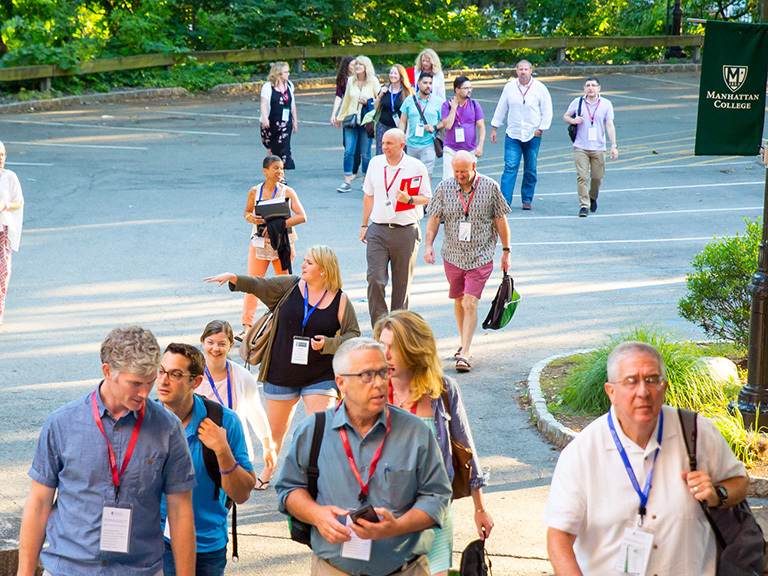 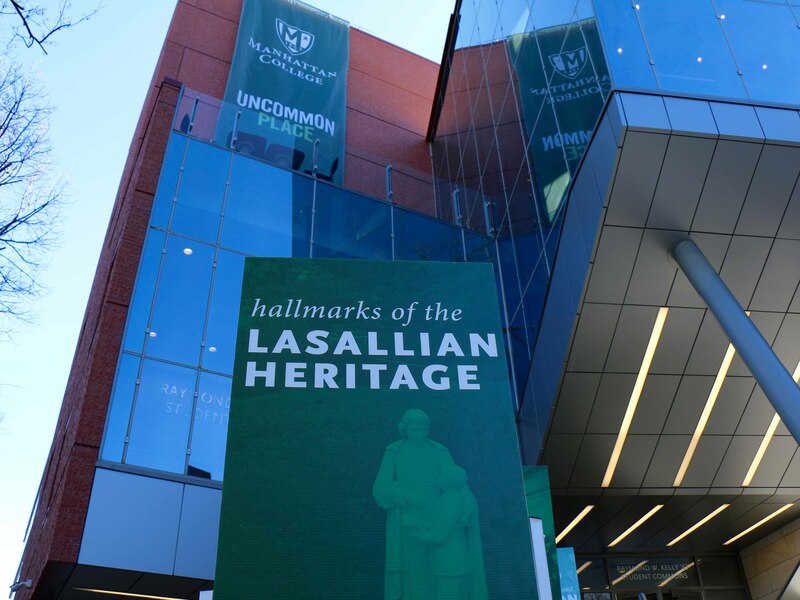 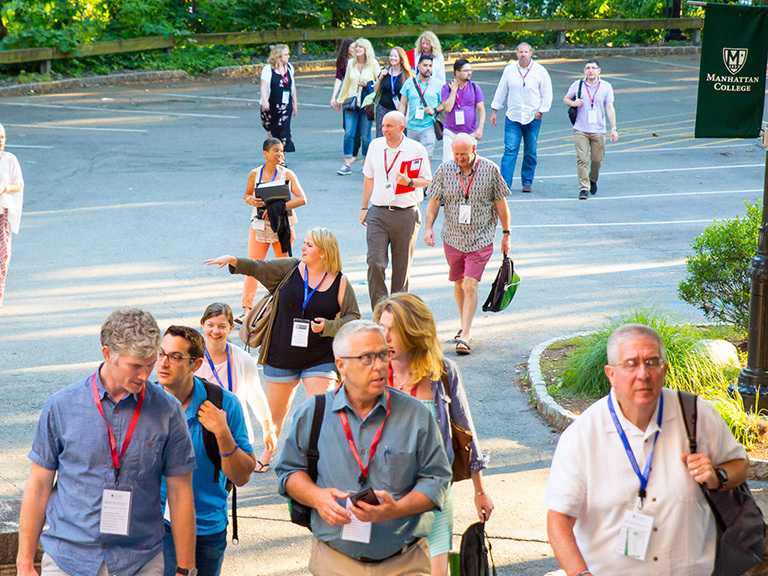 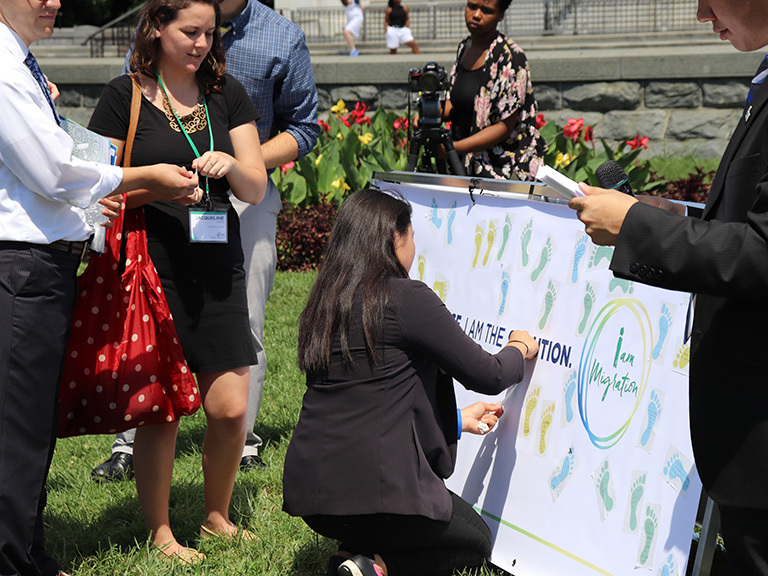 Eight faculty and administrators from Manhattan College joined more than 120 academics from the international Lasallian network to discuss the characteristics of Lasallian research at the 3rd international Lasallian Research Symposium from Sept. 28-30. 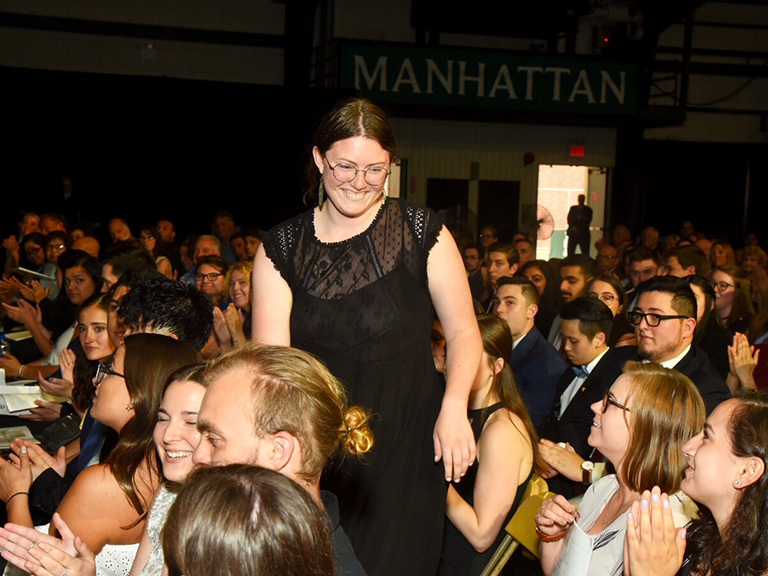 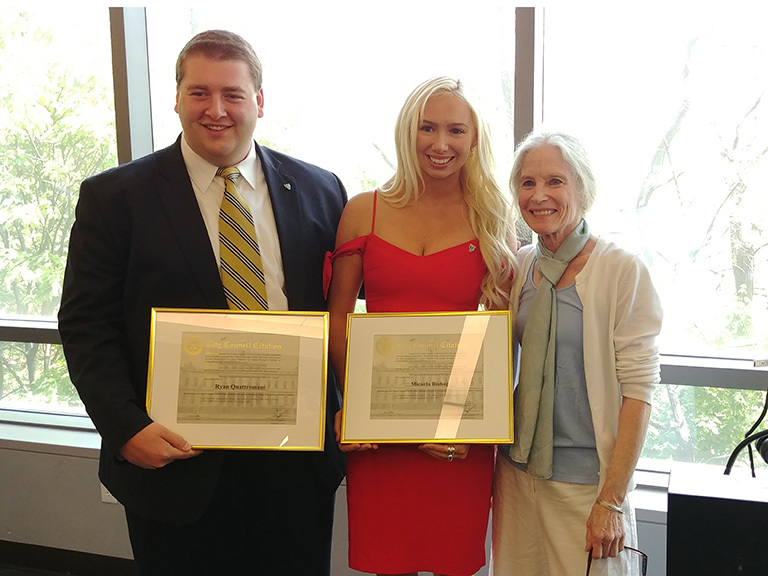 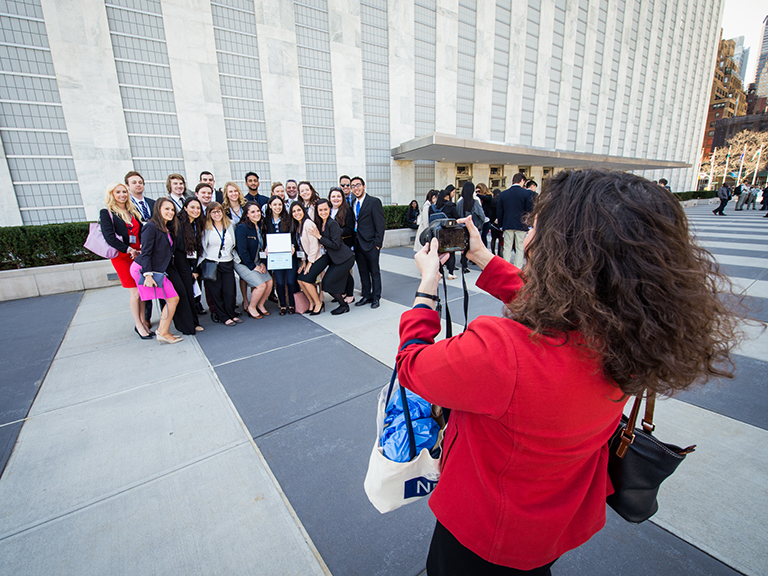 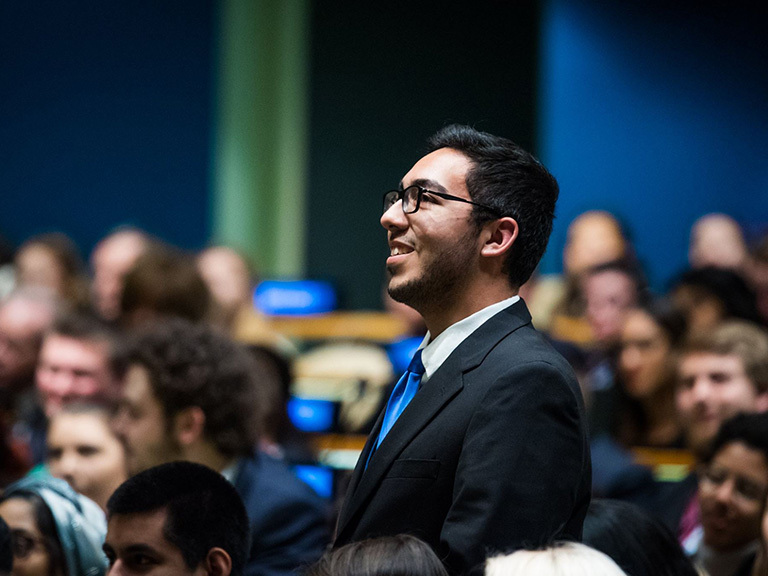 Manhattan's 60+ student clubs, organizations and honor societies take Jaspers from the floor of the New York Stock Exchange to the top of the George Washington Bridge. 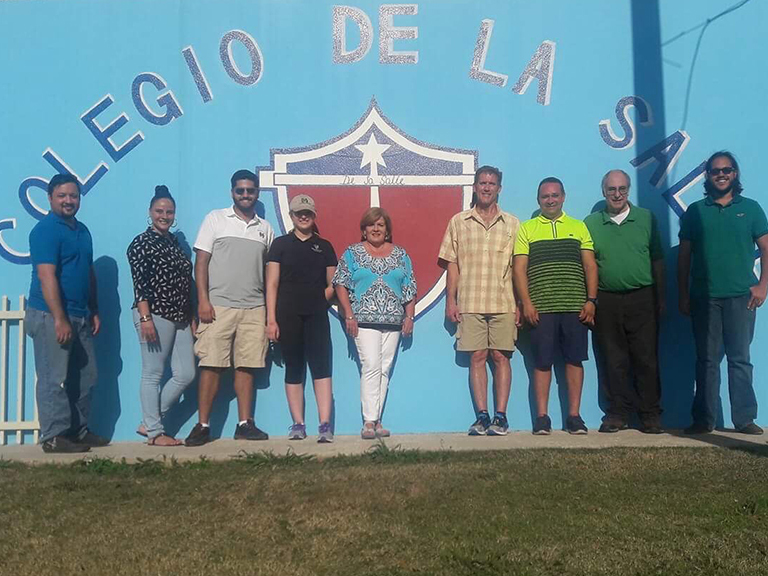 During a weeklong multifaceted study abroad experience in Havana, Cuba, more than a dozen Jaspers discover Lasallian resolve after 50 years of restricted religious practice. 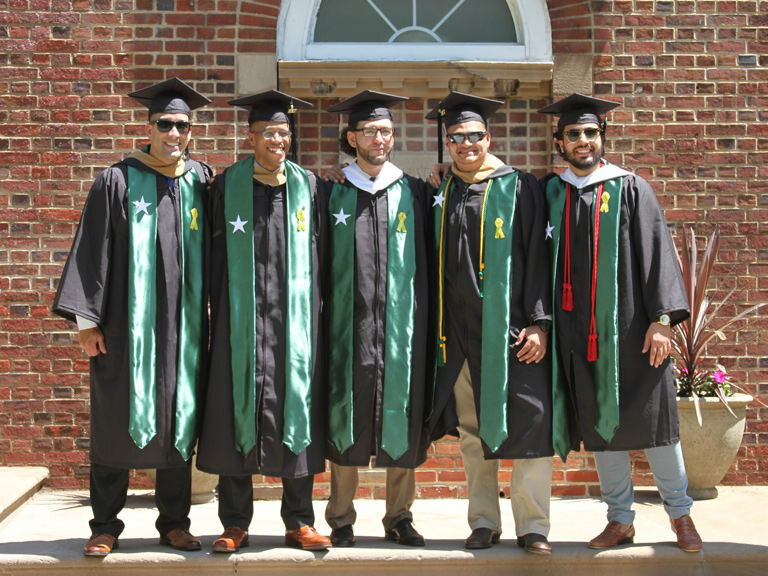 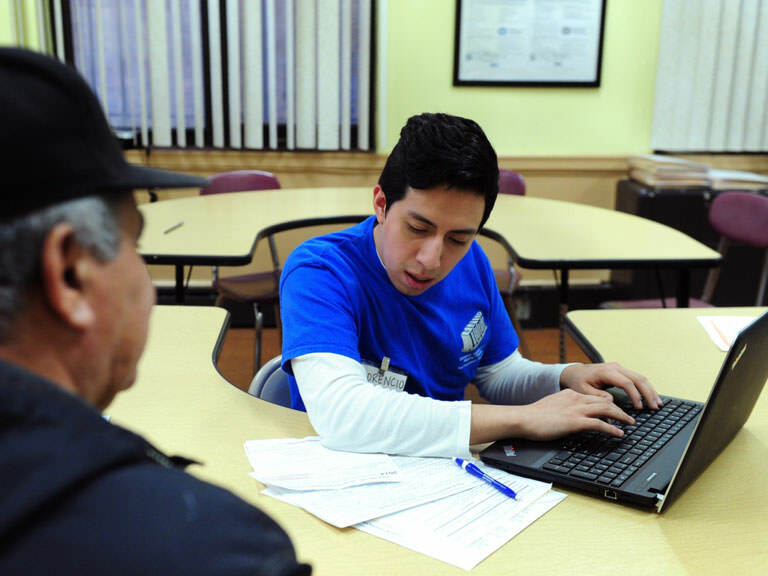 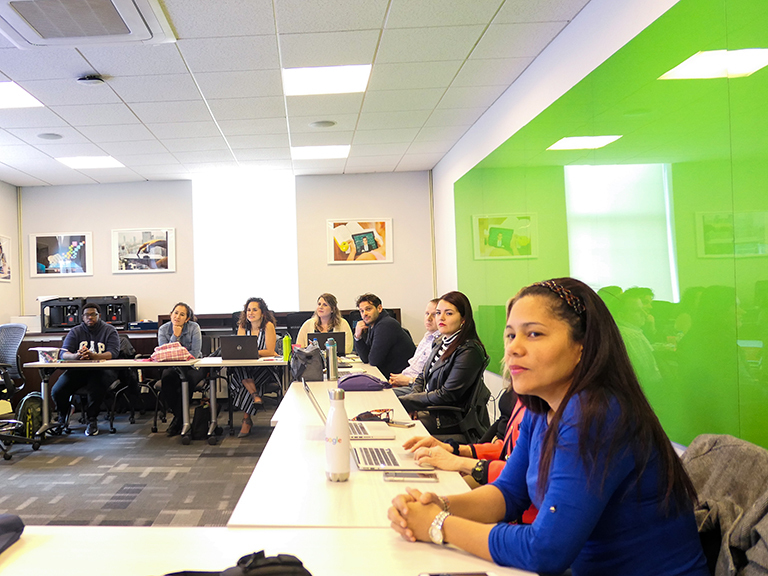 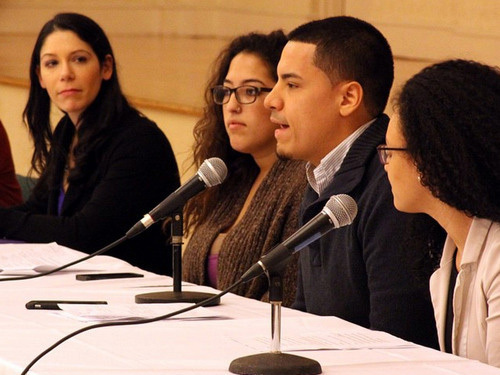 The highly competitive program consistently recruits Jaspers to lead a nationwide educational revolution in low-income communities. 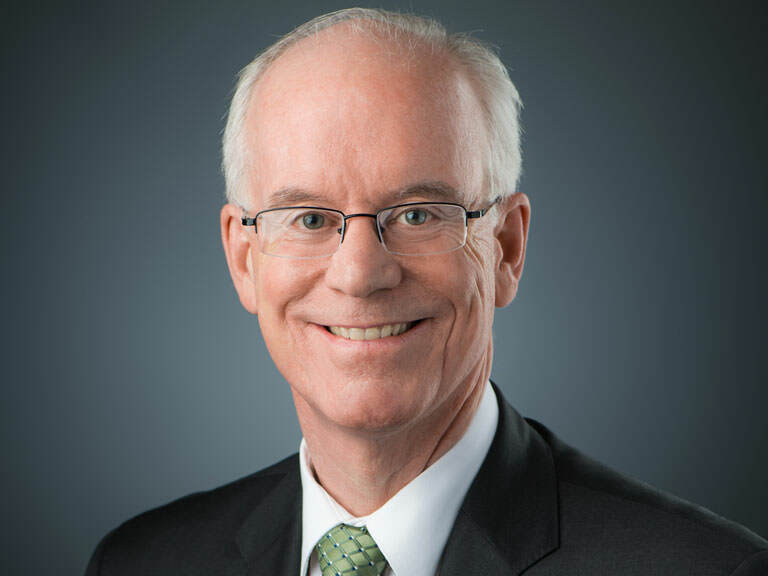 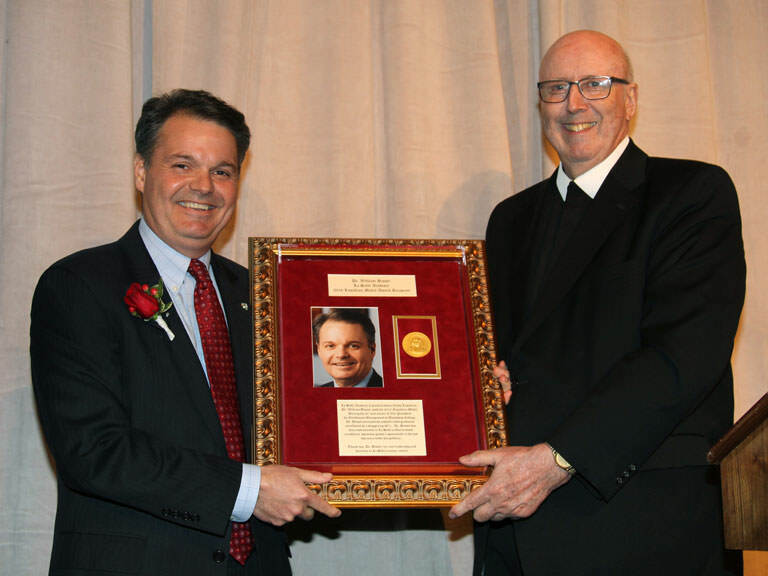 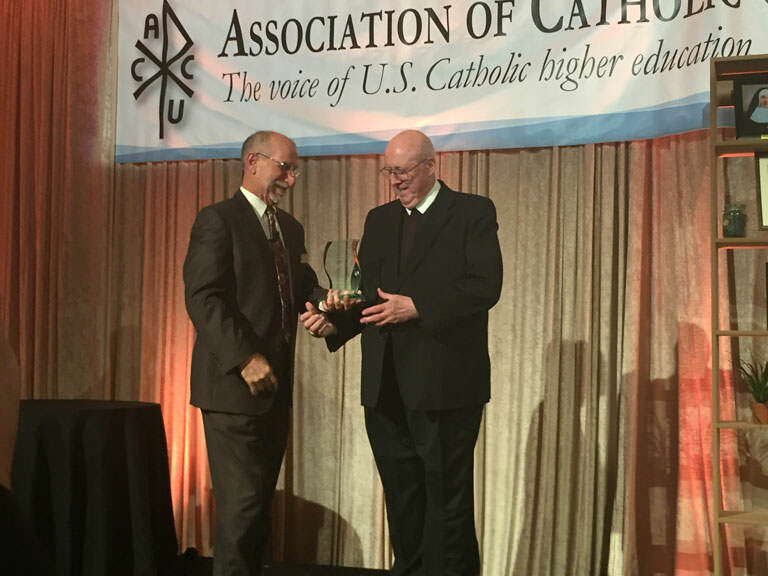 Brother Jack Curran ’80, FSC, joins the College this month. 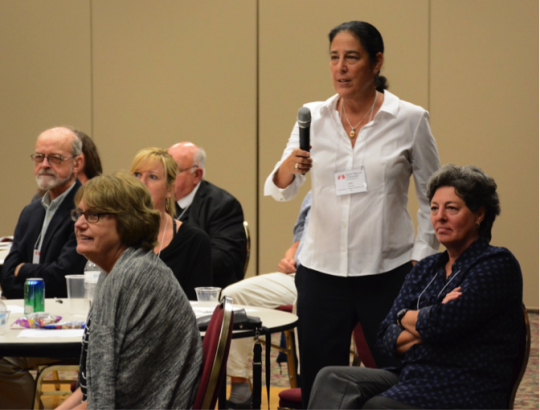 On Sept. 24, Carol Geary Schneider discussed the value of integrative educational practices at the collegewide faculty meeting. 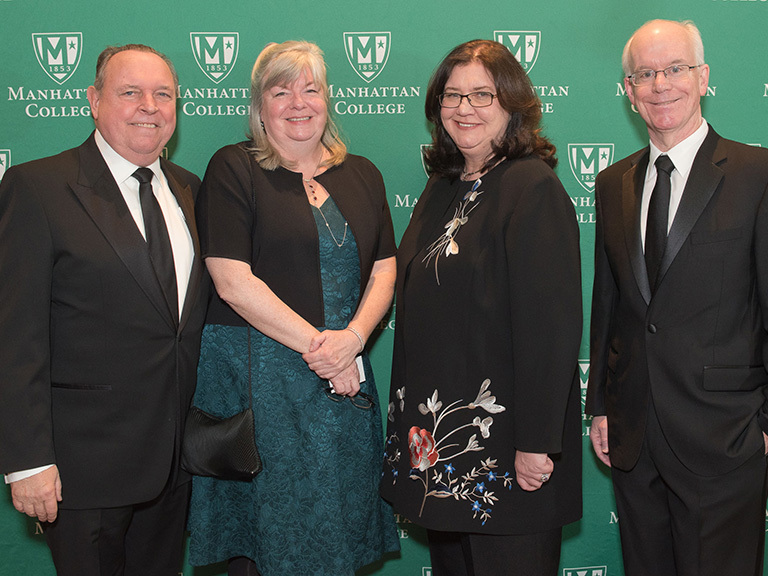 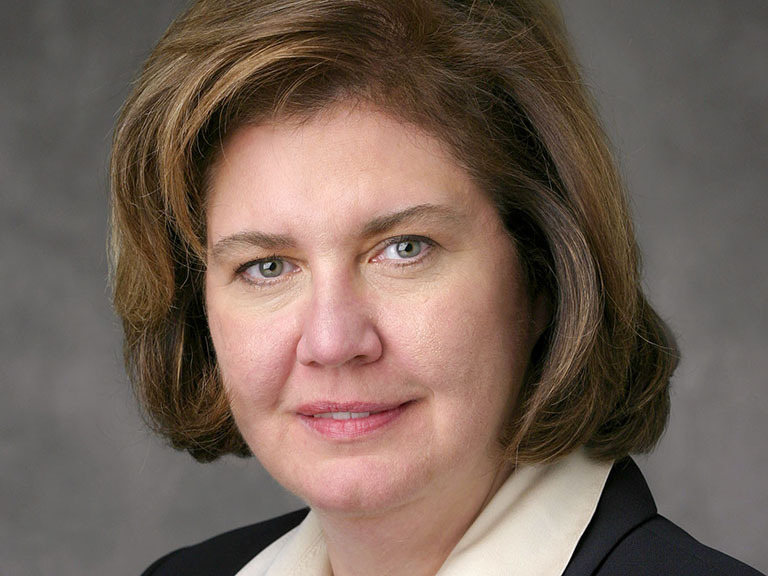 Muriel Siebert, a 15-year member of Manhattan College's board of trustees, dies at the age of 84.